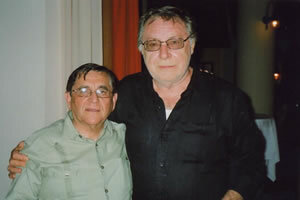 The remarkable Hispano-American Social Scientist and Cultural Researcher, Prof. J R Monroy and Psychologist J.L. Sylvester, founded a unique cultural-diplomatic project and organisation entitled LACCS-UK, to contribute to a better cultural understanding among all nations accredited at the Court of St.James's. J R Monroy studied History, Sociology and Law at the University of Chile but his lifelong interest in music was also immensely strong. He is a talented guitarist and when he arrived in London he was astonished to discover that the classical music of Latin America and the Caribbean was virtually unknown in Britain In general and amongst the London public in particular. Juan R. Monroy and J. L. Sylvester soon realised that the European perception of Latin American music, musicians and culture from a continent of several hundred millions of inhabitants was woefully deficient. They were determined to do something about it and the result was the foundation LACCS-UK with the collaboration of several Latin American Embassies, Caribbean High Commissions and groups of intellectuals, writers, musicians, historian, social scientists, etcetera. 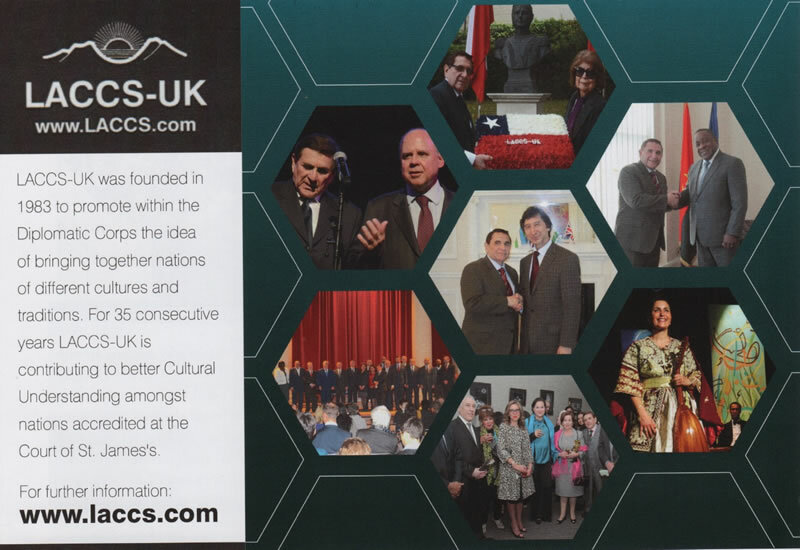 LACCS-UK has done notable work during the last three decades, to create a better international understanding in Britain of the Latin American culture and its universal legacies. Recently Prof. J R Monroy, Hon Chair LACCS-UK was received by H.E. Mr Kyaw Zwar Minn, Ambassador of the Republic of The Union of Myanmar. It was a friendly and educational meeting in Prof. J R Monroy learnt about the ancient Myanmar Civilisation in Asia. 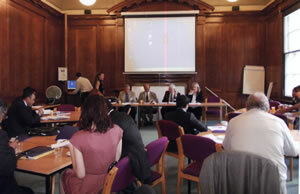 LACCS-UK recently visit to H.E. 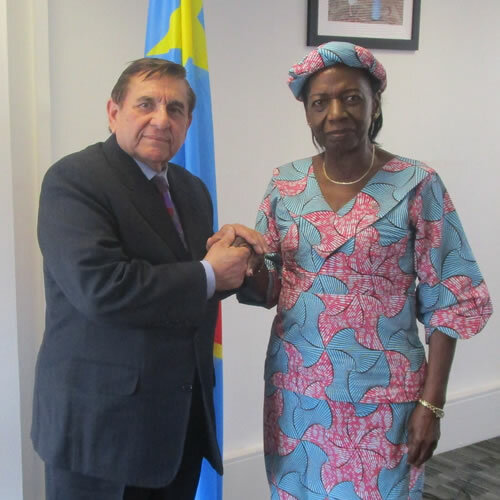 Marie Ndjeta Opombo, Ambassador and Representative to the International Maritime Organisation (IMO). Prof. JR Monroy, Hon. Chair - Public - Social and Cultural Diplomacy 36th Years Anniversary. Photo: H.E. 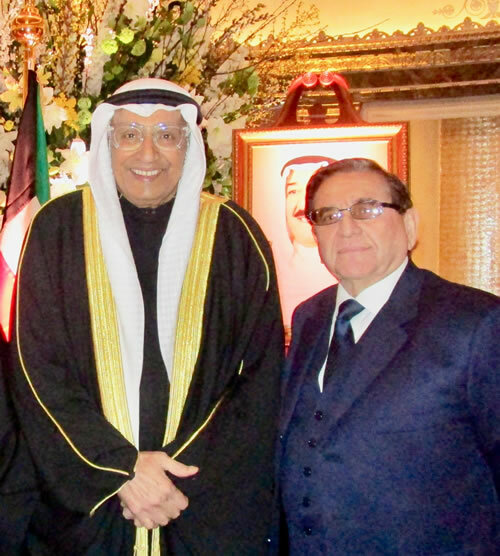 Mr Khaled Al-Duwaisan, Ambassador of the State of Kuwait to the United Kingdom and Professor J.R.Monroy, Hon. Chair LACCS-UK. 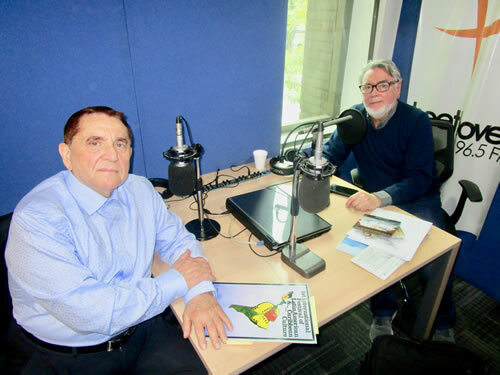 Mr Alvaro Menanteau, Musicologist and Director Radio Programme at Radio Universidad de Santiago, Chile and Prof. J R Monroy, LACCS-UK. An Interview by Alvaro Menanteau about LACCS-UK's music experience in United Kingdom. Talking about Chilean's contribution to LACCS-UK 36 years on promoting world music at international concert halls in London. 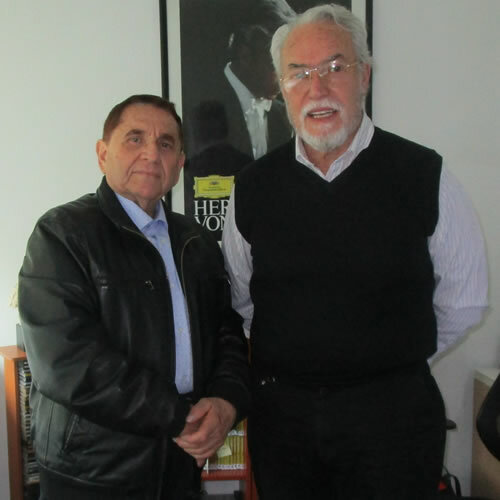 Professor J R Monroy, Founder and Hon,Chairman LACCS-United Kingdom, was received by Mr Adolfo Flores, Director of Radio Beethoven in Santiago, Chile, on Friday 21st October 2018. 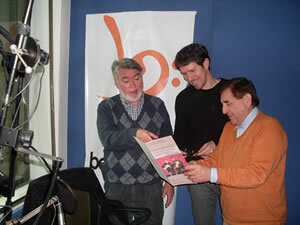 Professor Juan Monroy at Studio Radio Beethoven, Santiago, Chile, with Oscar Ohlsen, Producer of the radio programme 'Guitar'. 'Guitar' has been broadcast every Sunday since 1989 and features an hour of discussion with a selection of exclusive pieces for classical guitar. H.E. 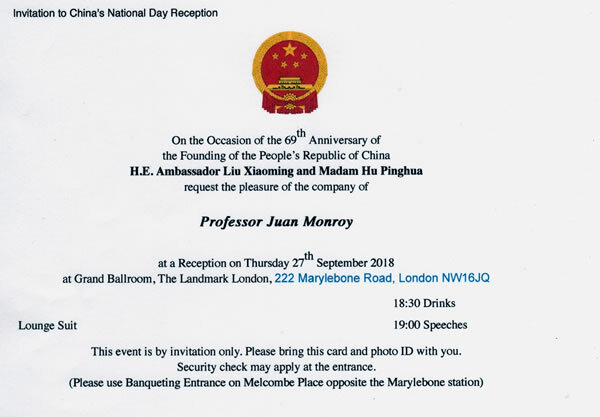 Ambassador Liu Xiaoming and Madam Hu Pinghua request the pleasure of the company of Professor Juan Monroy at a reception on Thursday 27th September 2018. 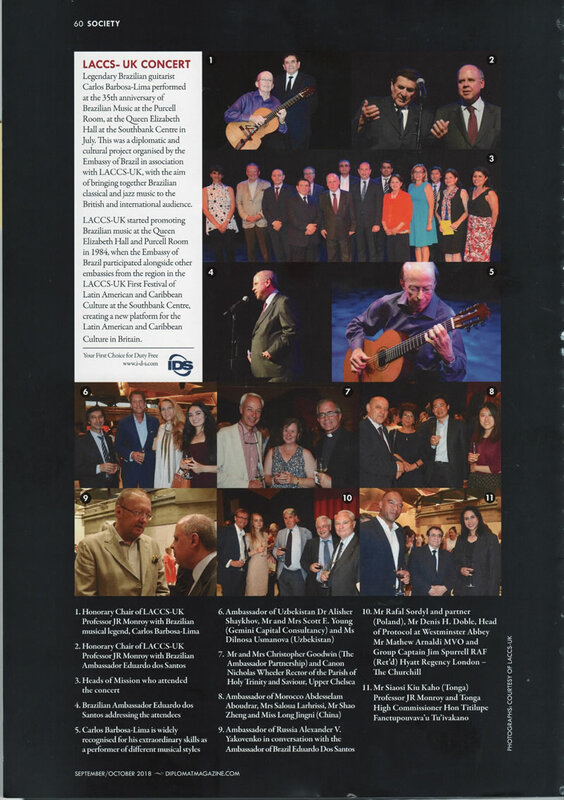 The Brazilian Music 35th Anniversary at the Purcell Room at the Queen Elizabeth Hall, Southbank Centre, was in July 2018 a great diplomatic and cultural success as it was reported by Diplomat Magazine, a prestigious U.K. international publication. 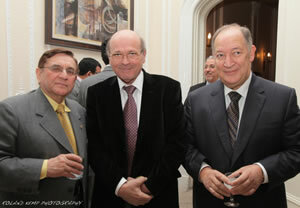 The concert and reception was attended by numerous Heads of Mission, and Diplomats. Carlos Barbosa-Lima's concert was given in a full house Purcell Room. You may also be interested in our featured interview with the Diplomat from May 2018. The Ambassador of Brazil H.E. 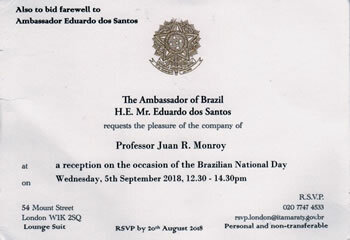 Mr Eduardo dos Santos requests the pleasure of the company of Professor Juan R Monroy a reception to celebrate the Brazilian National Day. Also to bid farewell to Ambassador Eduardo dos Santos. At H.E.Ambassador of Brazil Residence. H.E. 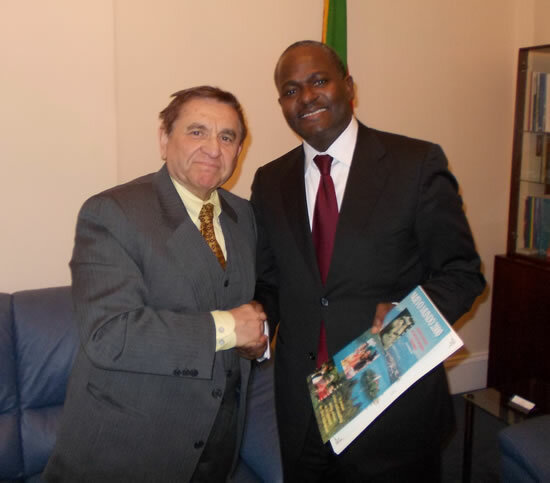 Mr Eduardo dos Santos and Prof. J.R. Monroy, Hon Chair LACCS-UK. LACCS-United Kingdom, courtesy visit to the Embassy of the Republic of Uzbekistan. 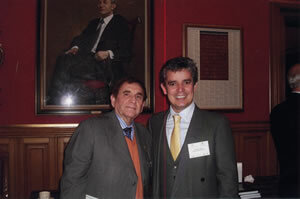 Left: Professor JR Monroy, Hon. Chair LACCS-United Kingdom and H.E. 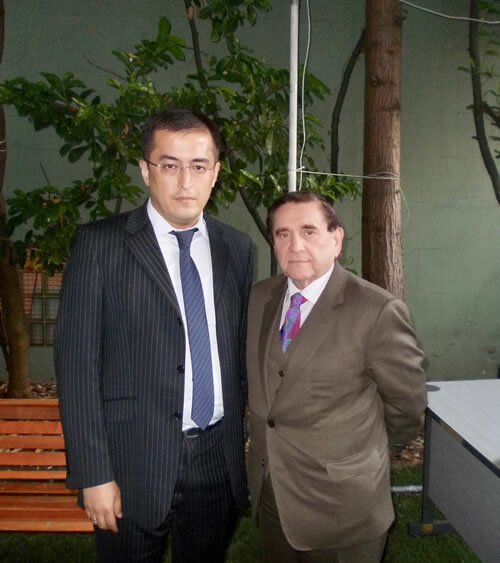 Dr Alisher Shaykhov, Ambassador of Uzbekistan to the Court of St. James's. 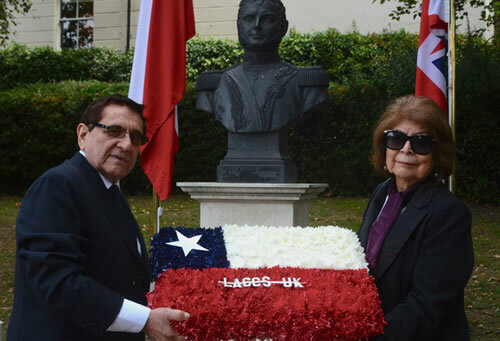 At O'Higgins Square, Bridge Road, Richmond-upon Thames, on Tuesday 21st August 2018, LACCS-UK payed homage to the memory of the 240th anniversary birth of General Bernardo O'Higgins Riquelme, Liberator of Chile and Peru (1778-1842). General Bernardo O'Higgins Riquelme, was born in Chillan, Chile in 1778 and he lived in Richmond from 1776-1779, where he studied at a private Academy, taken lessons in drawing and painting, classical languages, Latin and Greek, mathematics and geometry, swordsmanship, English, French, classical literature, etc, in summary he was educated as an English gentleman of the 18th century. O'Higgins personality changed completely when he met in London General Francisco de Miranda (1750-1816), who was a propagandist of the Hispano- American Independence. Young Bernardo was captivated by Miranda's ideals of freedom and by his plan to liberate Hispano-American colonies. In his return to Chile at the beginning of the 19th century, O'Higgins, immediately supported the liberation movement, finally he was one of the most important heroes of the Independence of Chile, Peru and Hispano-19 America (1817-1823). General Bernardo O'Higgins was the organiser of the 19th century Chilean State, democrat and a man of progressive social, political, commercial and cultural ideals. Maybe to be compared to other continental leaders such as Abraham Lincoln or George Washington. LACCS-UK laying the wreath at the bust of General Bernardo O'Higgins Riquelme O'Higgins Square, Bridge Road, Richmond-Upon-Thames. 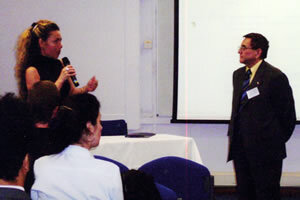 Representing LACCS-UK: Professors JR Monroy Hon. Chair and JL Sylvester, Executive Director. 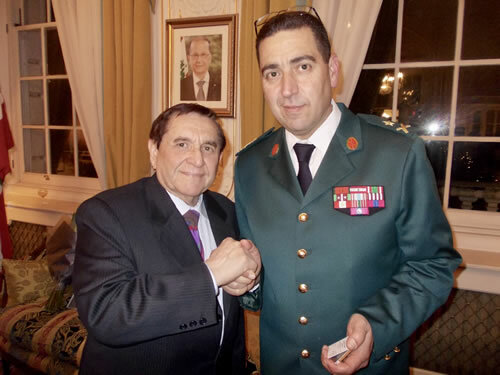 Coronel Christian Bolivar, Military Attache Embassy of Chile, Cllr. Ben Khosa, Mayor of Richmond-upon-Thames, Mrs Khosa, H.E. 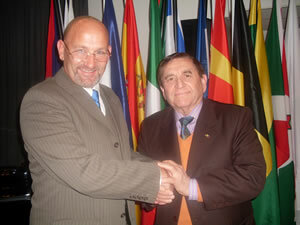 Mr David Gallagher, Ambassador of Chile and Professor JR Monroy, Hon. Chair LACCS-UK. 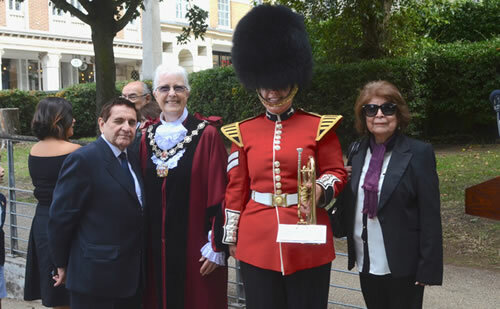 Cllr Mona Adams, Deputy Mayor, Richmond-upon-Thames, Prof. JR Monroy and Prof. JL Sylvester, Executive Director LACCS-UK with the lady Queen Guard who played the "Last Post" in remembrance to the Chilean hero. LACCS-UK attended the 19th Anniversary of the Enthronement of His Majesty The King Mohammed VI H.E. Abdesselam Aboudrar. 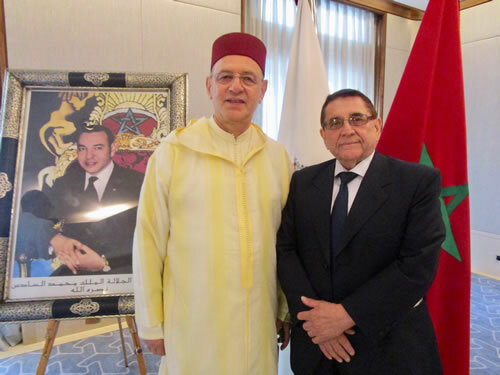 Ambassador of the Kingdom of Morocco requests the pleasure of the company of Professor J. R. Monroy, Hon. Chair at a Reception held at the Berkeley Hotel, Knightsbridge, London. 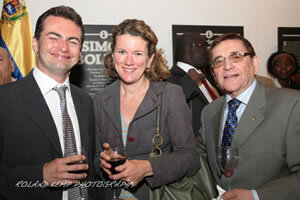 LACCS-UK visiting The Embassy of the Republic of Angola in London. Professor J R Monroy, Hon. Chair LACCS-UK was welcomed by H.E. 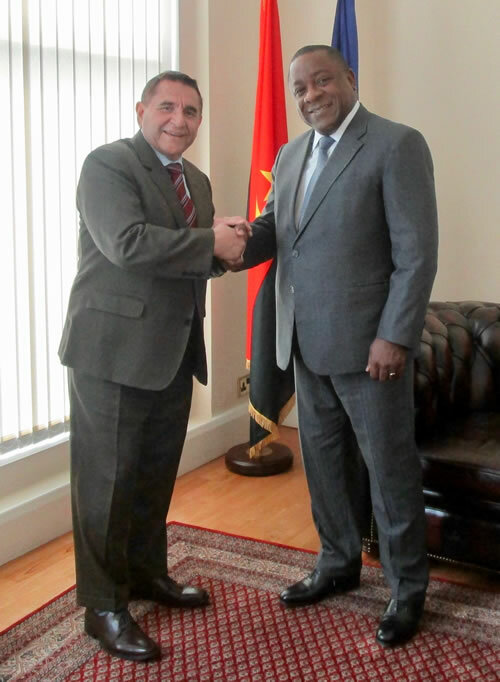 Mr Rui Mangueira, Ambassador of the Republic of Angola to the Court of St. James's. 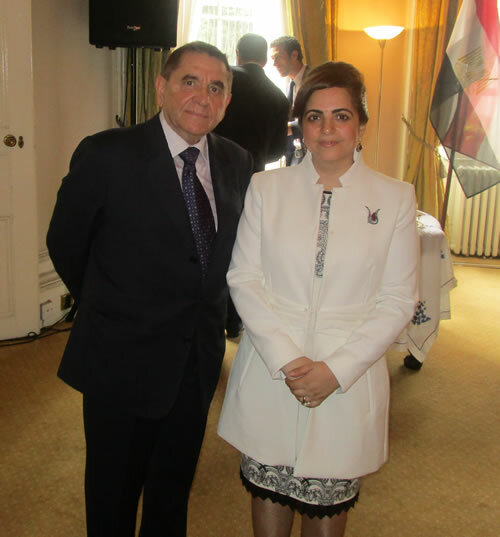 Ambassador of the Arab Republic of Egypt Residence in London. 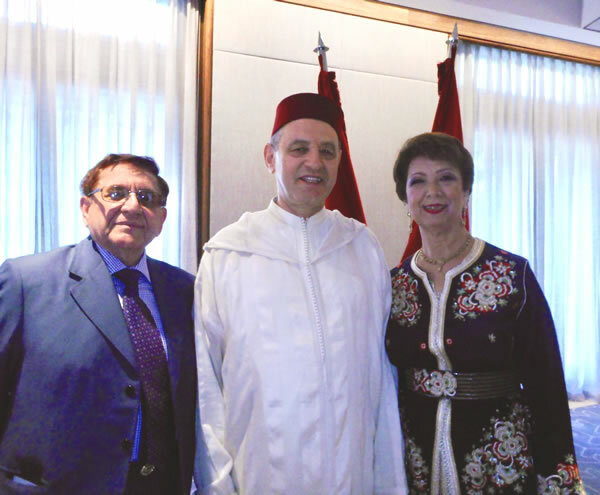 On the occasion of the 66th Anniversary of the National Day of the Arab Republic of Egypt, Charge d' Affaires Mrs Nermine El Zawahry, request the pleasure of the company of Professor J. R. Monroy, Hon. Chair LACCS-UK at a Reception on Monday 23rd July 2018 from 12.30 to 2.30pm. 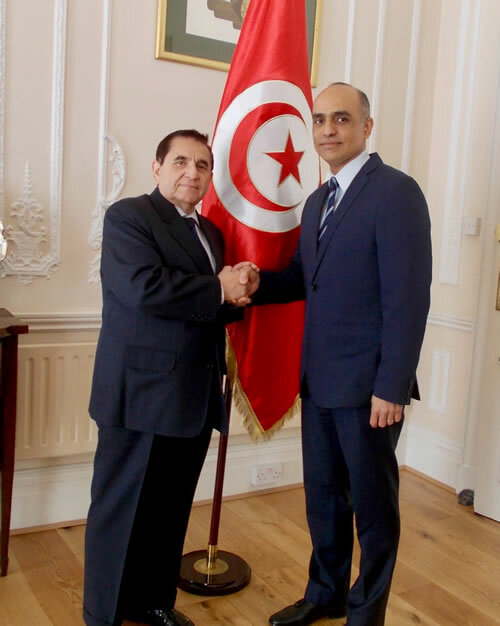 HE Mr Nabil Ben Khedher, Ambassador od Tunisia, received Professor JR Monroy. Hon. 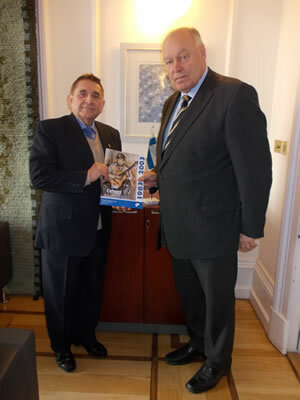 Chair LACCS-UK at His Excellency Office in London. 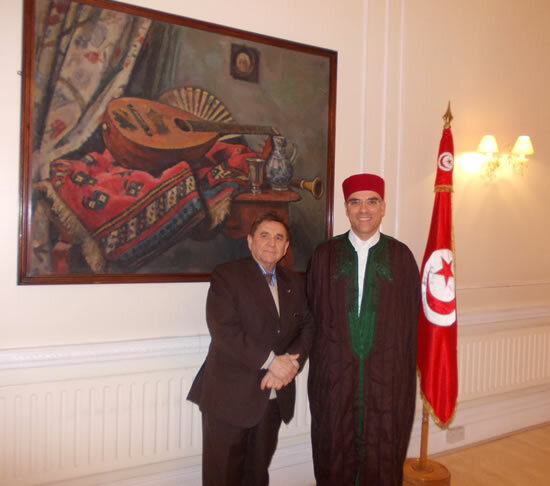 Prof. JR Monroy courtesy visit to the Embassy of Tunisia. 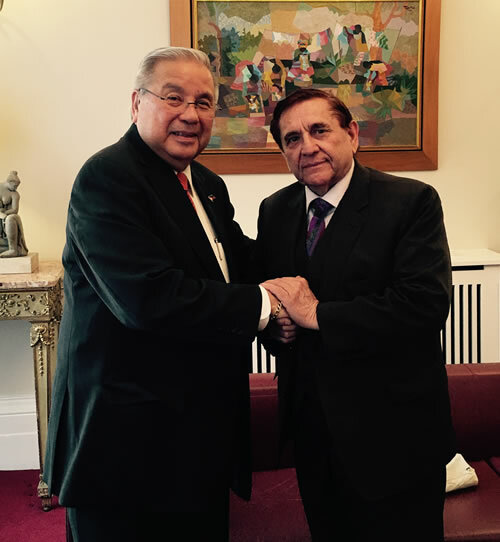 Professor J R Monroy, Hon Chair LACCS-UK was welcomed by His Excellency Mr Antonio Manuel Lagdameo, Ambassador of the Embassy of the Republic of the Philippines. 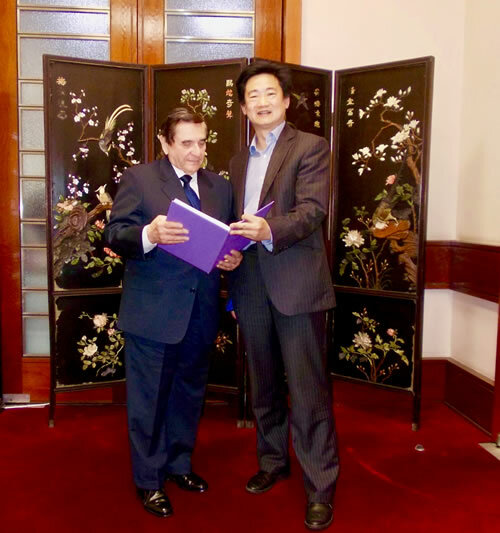 Professor J R Monroy was received by Mr Shao Zheng Counsellor at there Embassy of the People's Republic of China. Counsellor Shao Zheng presented to Prof. JR Monroy a decorative book with the photos and the history of the Embassy of People's Republic of China in United Kingdom. Visiting Ankara, Turkey with Brazilian guitarist Carlos Barbosa-Lima and Maestro Ahment Kanneci at the stage of the local theatre and before CBL performance. An invitation to LACCS-UK to be part of a Festival in Ankara. The Embassy of Uzbekistan in London in collaboration with British Uzbek Society (BUS), organised the event: 'Uzbek Youth Culture - Discover the Dynamic, Creative Millennials', an informative event of Uzbekistan education and culture. Dr Mansur Kamalov, Deputy Rector (Academic),Tashkent State University of Law and Professor J R Monroy, Hon Chair LACCS-UK. 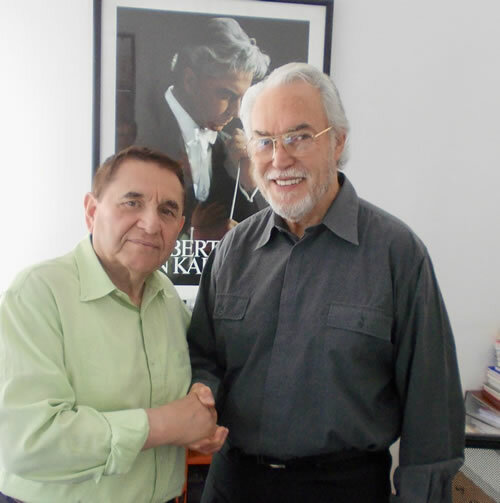 Professor J R Monroy, Founder and Hon,Chairman LACCS-United Kingdom, was received by Mr Adolfo Flores, Director of Radio Beethoven in Santiago, Chile, on Friday 29th March 2018. A mutual collaboration was agreed between LACCS-UK programme: 'Music Without Frontiers' and Radio Beethoven, which will be an online correspondent. Professor J R Monroy was invited by Canning House to the presentation of Canning Medal to H.E. Ivan Romero Martinez, Ambassador of Honduras and Dean of GRULA. Canning House, London SW1X 8PS. 24th January 2018. 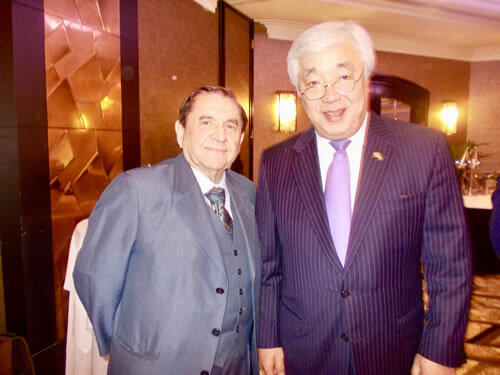 On the occasion of the Independence Day of the Republic of Kazakhstan His Excellency Erlam Idrissov and Professor J R Monroy, Hon. Chairman LACCS-UK. 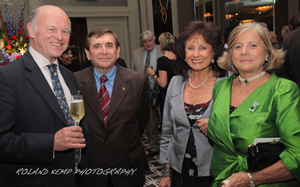 National Day Reception at the Jumeirah Carlton Tower 1 Cadogan Pl, Knightsbridge, London SW1X 9PY. Professor J R Monroy, Hon. 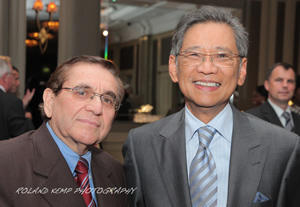 Chairman LACCS-UK and HE Mr Antonio M. Lagdameo, Ambassador of the Republic of the Philippines to the Court of St. James's. Laccs-UK Courtesy Visit To The Embassy Of The Republic Of Angola. H.E. Dr Miguel Gaspar Fernandes Neto, welcomed the courtesy visit of Professor J R Monroy, Hon. Chairman LACCS-UK. Tuesday 14th November 2017. On the occasion of the 94th Anniversary of the Proclamation of the Republic Mr Abdurrahman Bilgic, Ambassador of the Republic of Turkey and Mrs Esra Bilgic, requested the pleasure of the company of Professor J R Monroy at a Reception held at the Ambassador Residence, on Monday 30th October 2017. Professor J R Monroy, Hon. Chairman LACCS opened a diplomatic ceremony inviting the Heads of Mission attending the concert of the Embassy of Costa Rica organised in association with Latin American and Caribbean Cultural Society, an independent and non profitable organisation better known in England as LACCS-UK. My own reflection on my experience working with LACCS-UK for 34 Years On. Working for 34 years in the field of Cultural and Public Diplomacy in London, gave me a personal and professional satisfaction. However, I can honestly say, that doing my job, I learned and appreciated very much the thinking and cultures of many nations represented culturally, diplomatically and artistically in LACCS-UK's decades of hard work and dedication to promote the idea of bringing together nations of different cultures and traditions, and what is more, upgrading the co-operative spirit within the Diplomatic Community in the United Kingdom. H.E. 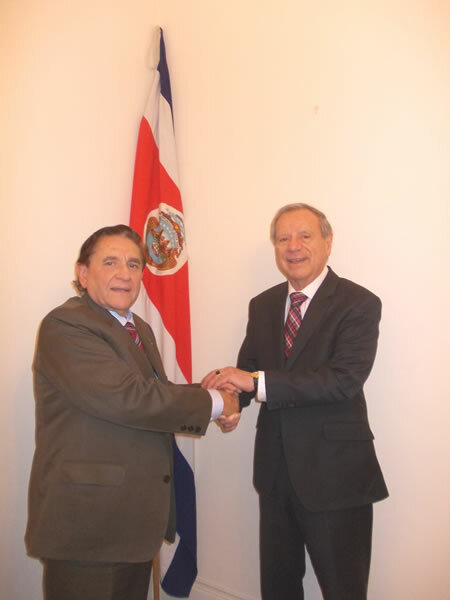 Dr Jose Enrique Castillo Barrantes, Ambassador of Costa Rica, and Professor J R Monroy, Hon. Chairman LACCS-UK were accompanied by a significative numbers of Heads of Missions from Latin America, Caribbean Region, Europe, Africa and Asia. His excellency Señor Jose Enrique Castillo Barrantes and Professor JR Monroy, Hon. 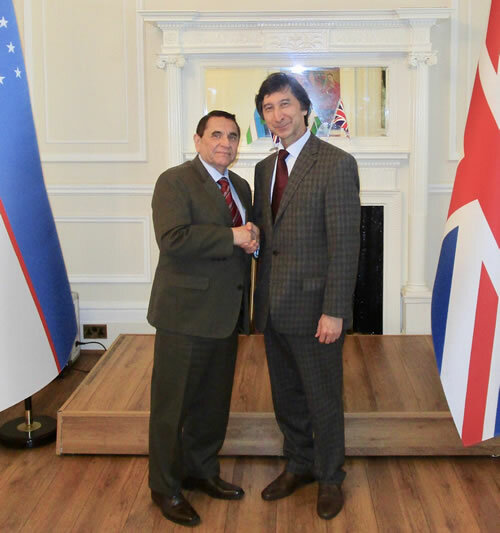 Chairman LACCS-United Kingdom, recently agreed to collaborate in an special cultural project to promote Costa Rican young musicians and composers in U.K.
LACCS-UK AT THE FOREIGN AND COMMONWEALTH OFFICE (FCO). Professor J R Monroy, Hon. Chairman LACCS-UK was welcomed at the FCO by Mr Nigel Baker, Head of South American Department and Deputy Director Americas. King Charles Street, London SW1A 2AH. CELEBRATION OIF BOLIVIA NATIONAL DAY 3rd August 2017. 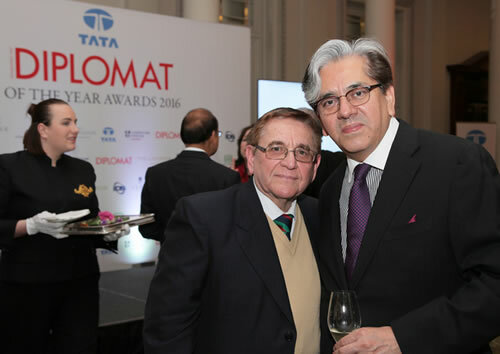 Profesor J R Monroy, Hon, Chairman LACCS-UK and HE Mr Roberto Calzadilla Sarmiento, Embajador de Bolivia to the Court of St. James's. 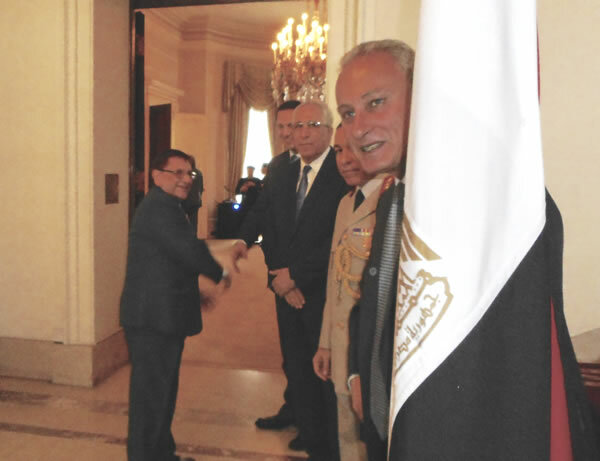 Celebration of the Arab Republic of Egypt National Day at the Ambassador Residence in London. Prof. JR Monroy, Hon. Chairman LACCS-United Kingdom was welcomed by H.E. Mr Nasser Ahmed Kamel, Ambassador of the Arab Republic of Egypt. 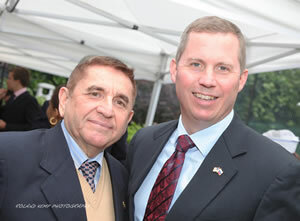 Celebration of Bulgaria National Day at the Ambassador Residence, 6th March 2017. 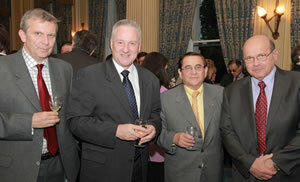 Front left to right: H.E.Mr Konstantin Dimitrov, Ambassador of the Republic of Bulgaria, Professor J.R. Monroy, Hon. 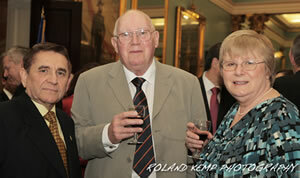 Chairman LACCS-UK, Commodore Mr Kostas Andreev, Military, Air and Naval Attache Embassy of Bulgaria and Mrs Andreeva. At Kuwait National Day Celebration: 23rd February 2017, Dorchester Hotel Park Lane, London W1. Professor J R Monroy, Hon. Chairman LACCS-UK, Min. David Najera, Minister and Charge d' Affaires a.i. Embassy of Mexico, Ms Jacqueline Orozco Gutierrez, Assistant, Embassy of Mexico. 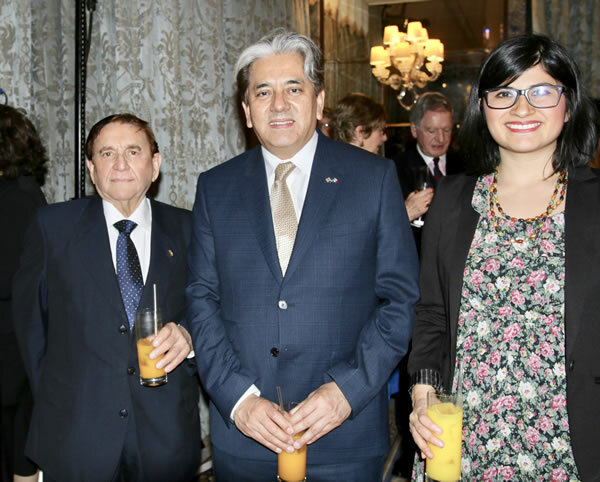 206th Anniversary Celebration of the Independence of Chile at the Hyatt London, Sept., 2016. H.E. 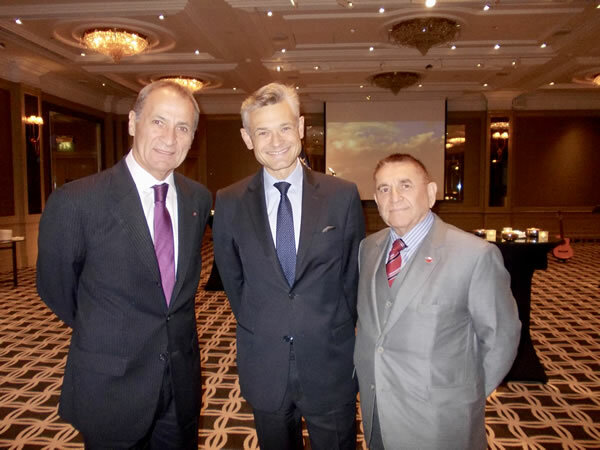 Mr Rolando Drago Rodriguez, Ambassador of Chile, Mr Arnaud de Saint-Exupery, General Manager/ Area Vice President U.K. & Ireland, Hyatt Regency London - The Churchill and Professor J R Monroy, Hon Chairman LACCS-UK. 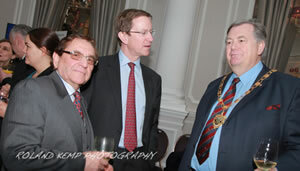 At the Chartwell Suite Professor J R Monroy, Hon Chairman LACCS-UK and General German Octavio Schell O' kuinghttons. 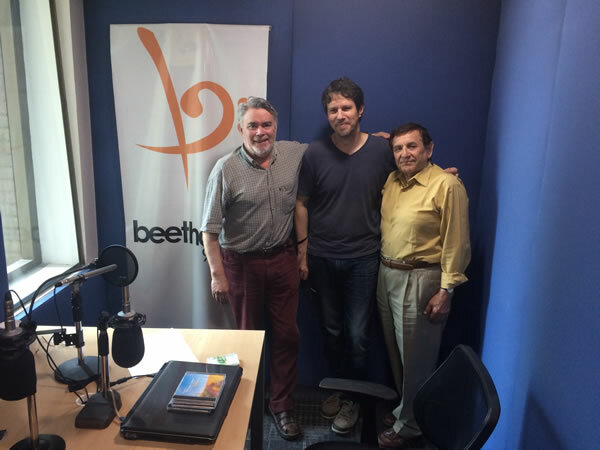 Professor J R Monroy during his journey to Chile was invited by Radio Beethoven for an interview and conversation with Oscar Ohlsen, conducting the 32 years on radio programme entitled "Guitar", which is broadcast every Sunday at mid day. 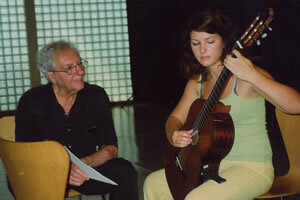 This is one of the oldest radio programme focus in the classical guitar. This radio conversation will be broadcast on line on Sunday 8th February 2017 at 12 hrs (Chilean time). You may listen to the interview below. LACCS-UK was welcomed by the Rt Hon. Boris Johnson MP, today Secretary of State for Foreign and Commonwealth Affairs. and opportunity to explained LACCS-UK's moto to contribute "to a better cultural understanding amongst all nations accredited to the Court of St.James's,"
Since 1983 more than 400 musicians from 100 nationalities has been introduced to British audiences. LACCS-UK was invited to attend the Evensong of the Republic of Mozambique National Day attended by H.E. The High Commissioner for Mozambique. Westminster Abbey, London. From left to right: H.E. Mr Felipe Chidumo and Prof. JR Monroy, LACCS-UK. 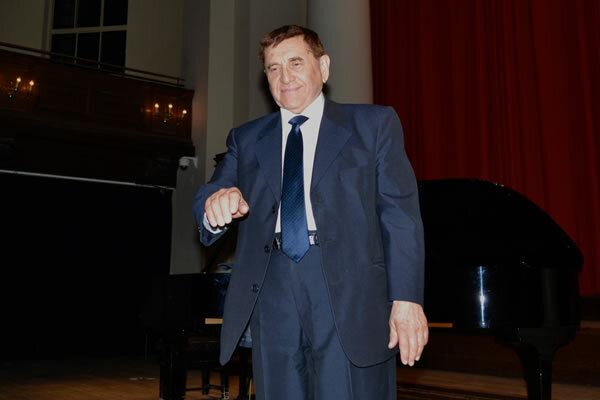 Ambassador of the Slovak Republic Mr L'ubomir Rehab requested the pleasure of LACCS-UK at the Slovak Dances Concert, performed by composer and pianist Peter Breiner, celebrating the opening of the Slovak Presidency of the Council of the European Union, Thursday 7 July 2016 at St.John's Smith Square, London SW1P 3HA. H.E. 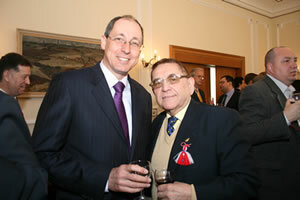 Mr L'ubomir Rehab and Professor JR Monroy, LACCS-UK after the successful diplomatic and cultural evening. 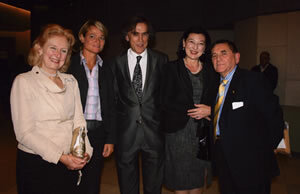 From left to right: Mrs Valentina Prevolnik Rupel, H.E. 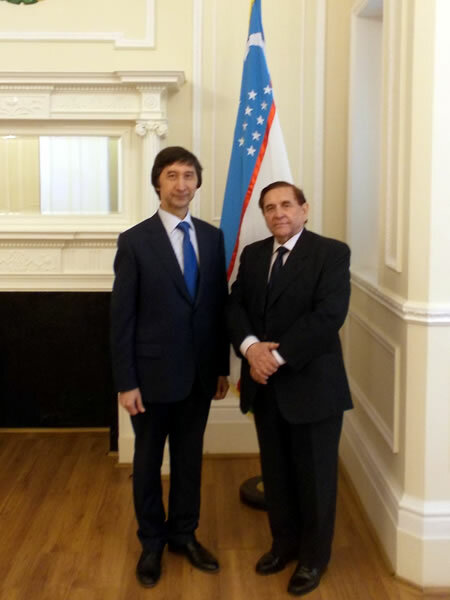 Mr Tadej Rupel, Ambassador of the Republic of Slovenia and Professor J. R. Monroy, Hon. Chairman LACCS-UK. 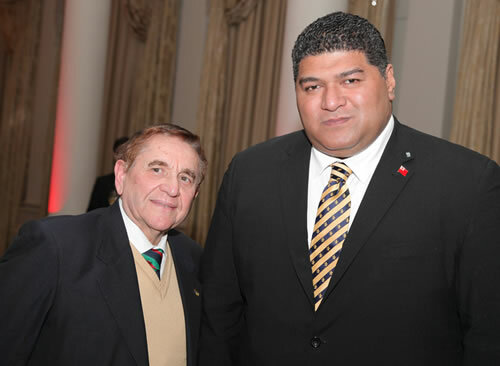 From left to right: Professor J R Monroy, Hon. Chairman LACCS-UK, H.E. Mr Amar Abba, Ambassador of Algeria. H.E. 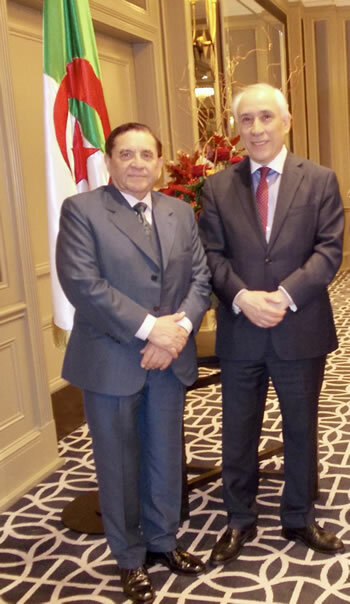 Mr Nabil Ammar, Ambassador of Tunisia, and Mr Mohamed Yahya Sidi Haiba, Charge d' Affaires of Mauritania. Prof. J R Monroy Hon. Chairman LACCS-UK and Beihdja Rahal. Pre-concert rehearsal at the stage of Cadogan Hall. 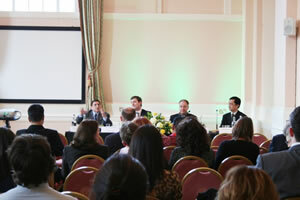 UK-Bolivia Trade & Investment Forum Sheraton Piccadilly, Central London. Prof. J R Monroy , representing LACCS~-UK and Ing. Alberto Tejada Ferrufino, Vice President ENDE Corporation. Professor J R Monroy, Hon Chairman LACCS-UK was invited by H.E. 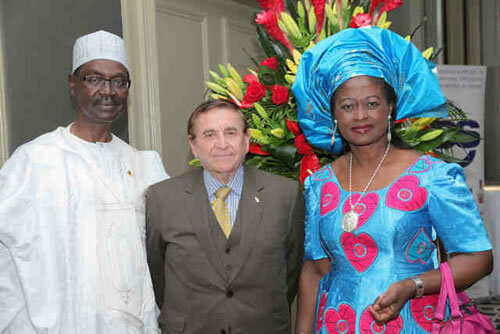 Mr Nkwelle Ekaney High Commissioner for the Republic of Cameroon and Mrs Janet Mejane Ekaney, to the diplomatic reception on the occasion of the Republic of Cameroon National Day, held at Hyatt Regency, The Churchill, Portman Square, London. Tata Diplomat of the Year Award ceremony held at Langham Hotel, Tata Diplomat of the Year Award. Photo No 1: Professor J R Monroy, Hon Chairman LACCS-UK and HE Mr Sione Sonata Tupou, Tonga High Commissioner. Prof. J R Monroy, Hon Chairman LACCS-UK and Mr David Renato Nanjera Rivas, Minister, Deputy Head of Mission Embassy of Mexico. 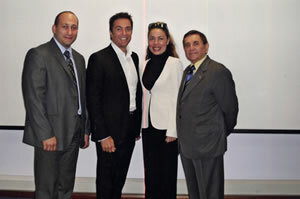 From left to right: Professor J R Monroy, Hon. Chairman LACCS-UK, Mrs Youssef, Mrs & Mr Anouar Ben Youseff, Deputy Head of Mission, Embassy of Tunisia, Mrs Miriam Nasser and H.E. 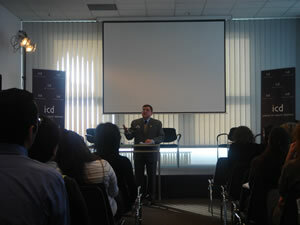 Mr Ivan Romero Martinez, Ambassador of Honduras. H.E. 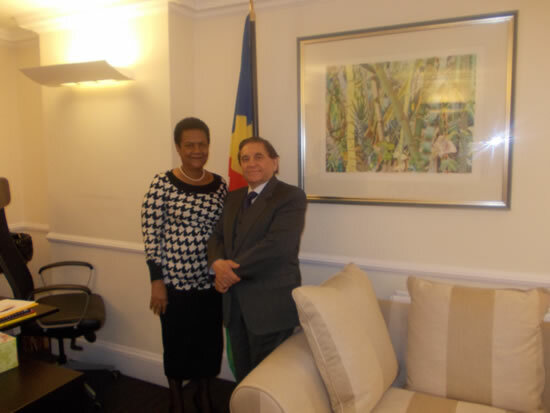 Marie-Pierre Lloyd High Commissioner for the Republic of Seychelles and Professor J R Monroy, Hon Chairman LACCS-UK. Professor J R Monroy had the opportunity to introduced himself and LACCS-UK's work in the field of Cultural Diplomacy in United the Kingdom. 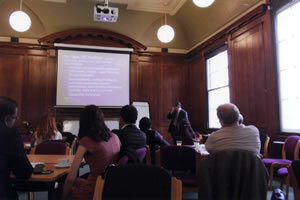 LACCS-UK's contribution to improve cultural understanding among all nations accredited at the Court of St. James's. H.E. 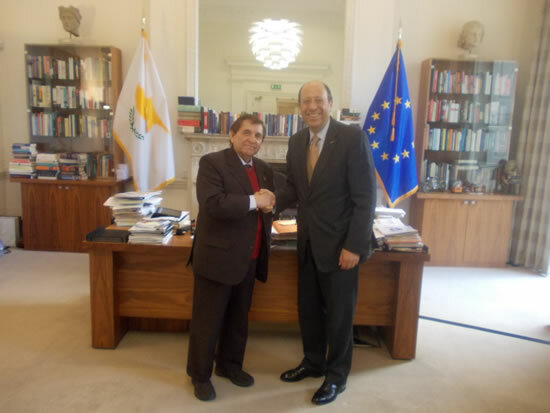 Mr Euripides L. Evriviades, High Commissioner fror the Republic of Cyprus, welcomed Professor J.R Monroy, Hon, Chairman LACCS-UK courtesy visit to His Excellency Office in London. Prof. JR Monroy visit to Cyprus High Commissioner is part of an annual diplomatic and social programme to strengthen cultural ties and friendly social relations with Cyprus and other Missions in London. 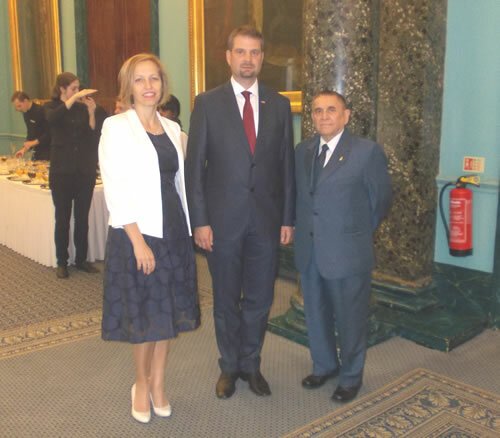 LACCS-UK attended for many year the celebration of The Slovak Republic National Day in London. In the past years contributed to enhanced the country's rich cultural legacies, specially in the field of classical music. LACCS-UK looks forward to continue its collaboration with the Embassy of the Slovak Republic in the field of Cultural Diplomacy. H.E. The Ambassador of the Slovak Republic and Mrs Dana Rehak welcoming Prof. JR Monroy, Hon. Chairman LACCS-UK. 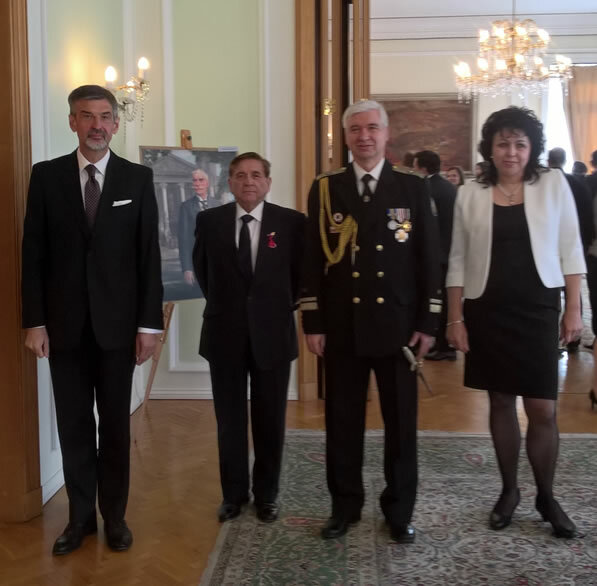 The social and diplomatic gathering to celebrate the Slovak Republic National Day was attended by numerous diplomats and guests from the public and private sector. During this commemorative occasion H.E. Mr L'ubomir Rehak addressed the audience with an historical account of the relations between United Kingdom and The Slovak Republic. 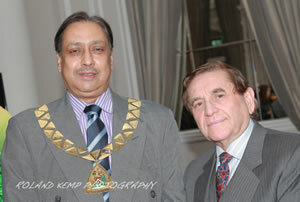 Mr Zakaria Nasir, Deputy High Commisioner, High Commission of Malaysia and Professor JR Monroy, Hon.Chairman LACCS-UK. 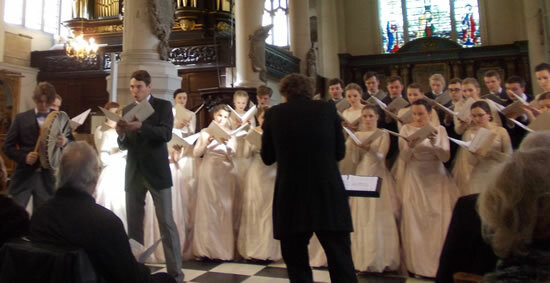 LACCS-UK was invited to attend the concert to celebrate the Latvian Presidency of the Council of the European Union with KAMER YOUTH CHOIR at St. Sepulchre Without Newgate Church, Holborn Viaduct, London EC1A 2DQ. 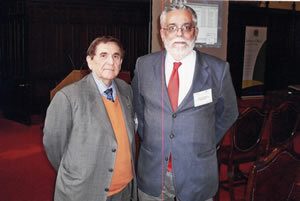 Prof J R Monroy with H.E. 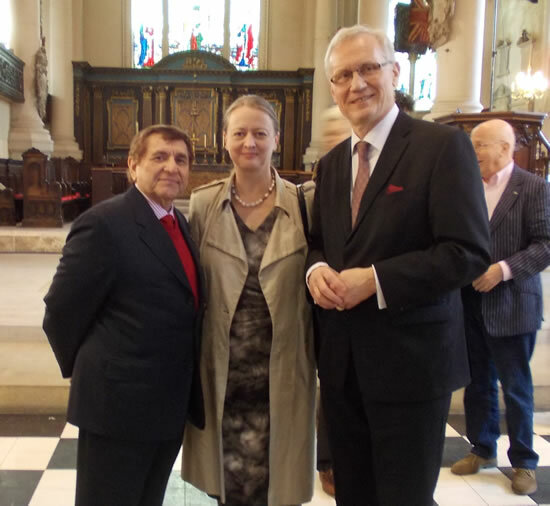 Mr Andris Teikmanis, Ambassador of the Republic of Latvia and Mrs Inguna Penike, at the concert of the Youth Choir KAMER held at the St. Sepulchre Without Newgate Church Holborn, Viaduct, London EC1A 2DD. Youth Choir KRAMER, conducting by Janis Liepins, performed a full programme of Latvian folk songs, some of them of medieval origins. 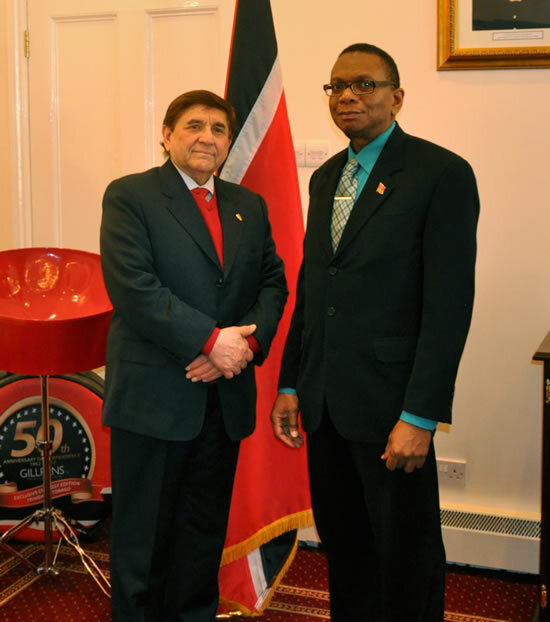 Professor J R Monroy, visited Mr Tedwin Herbert, Charge d' Affaires for the High Commission of the Republic of Trinidad and Tobago. Professor J R Monroy visiting Mr Tedwin Herbert, Charge d' Affaires High Commission of the Republic of Trinidad and Tobago. Behind is a nice steel drum, which is the modern instrument invented in Trinidad and Tobago earlier 1930's. 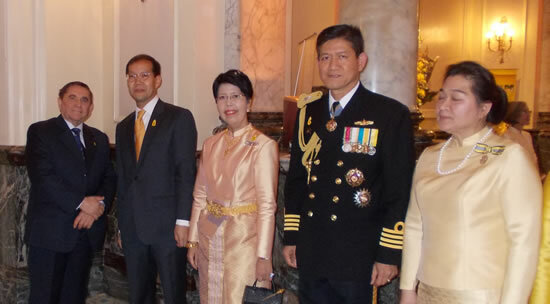 Professor J R Monroy attending the King of Thailand Royal Birthday. A VISIT OF COURTESY TO H.E. 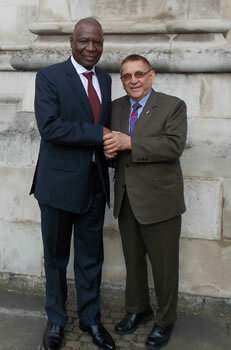 MR CARLOS DOS SANTOS HIGH COMMISSIONER OF THE REPUBLIC OF MOZAMBIQUE London, Tuesday 25th March 2013. 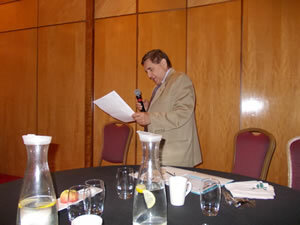 Prof. J R Monroy, Founder and Chairman LACCS-UK-UK and H.E. 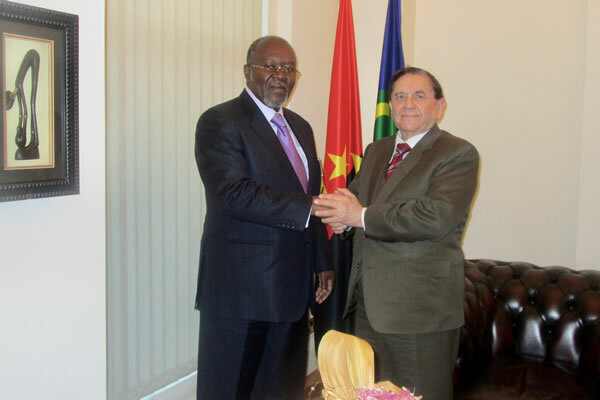 Mr Carlos Dos Santos, High Commissioner for the Republic of Mozambique. 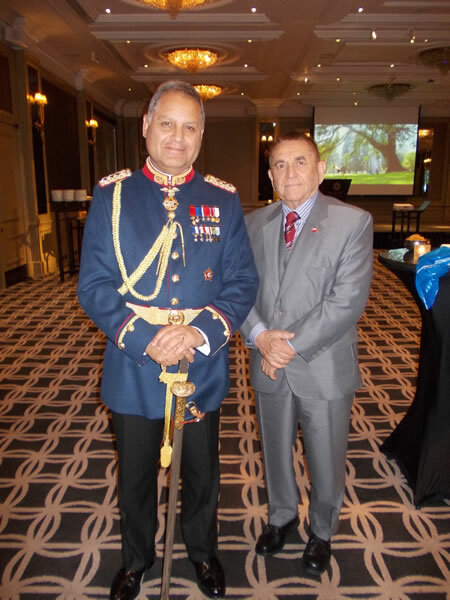 Professor J R Monroy, Founder and Chairman, LACCS-UK-UK was invited to the celebration of the 85th Anniversary of the Chilean Air Force (FACH), on Thursday 21st March 2013. 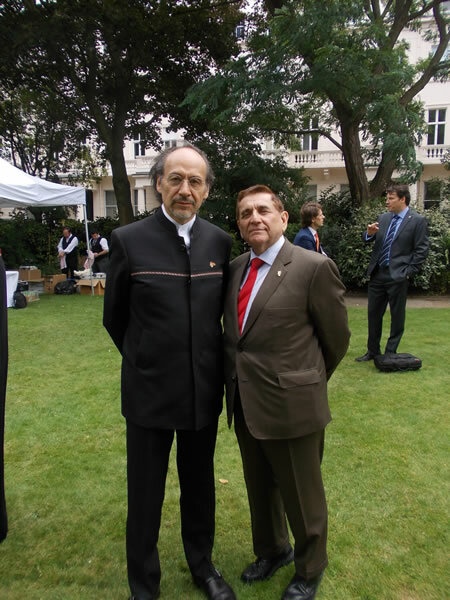 Professor J R Monroy and Group Captain Rafael Carrere, Air Attache at the Embassy of Chile in London. 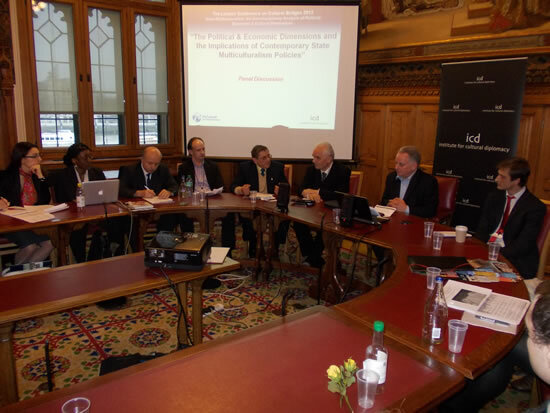 Prof. J R Monroy, Chairman, LACCS-UK-UK was Speaker at the ICD 2013 "The Cultural Bridges Conference in U.K., which was held at the House of Commons on the 20th March 2013. Prof. J R Monroy was a panelist in the subject "The Political and Economic Dimensions and the Implications of the Contemporary State Multiculturalism Policies:"
H.E. Mr Nabil Ammar, Ambassador of Tunisia, and Professor J.R. Monroy, Chairman Latin American and Caribbean Cultural Society, a courtesy visit. 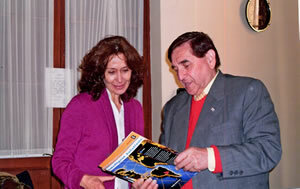 Prof. J.R. Monroy, presented an archive copy of "Nuevo Mundo 2000", to H.E. 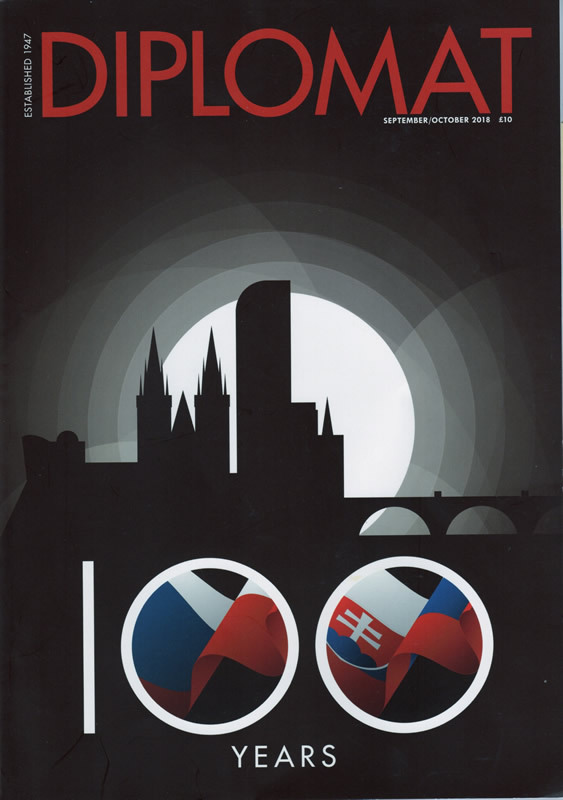 Ambassador Volodymyr Khandogiy, this publication was edited on the occasion of the Eleventh Heads of Mission Assembly, held at Le Meridien Hotel, on the 8th November 2000. In this memorable diplomatic gathering, H.E. 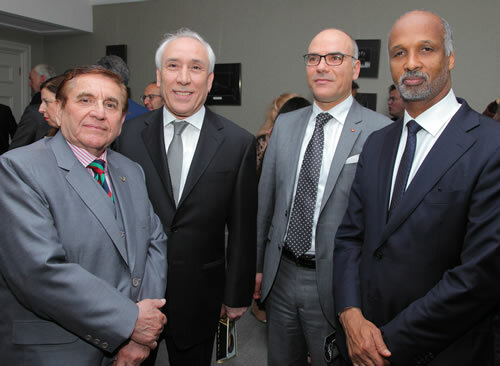 Ambassador Professor Volodymyr Vassylenko, co-hosted the diplomatic event, alongside Their Excellencies Mr Ma Zhengang, Ambassador of the People's Republic of China, Mr Patrick Edwards, Acting High Commissioner for the Republic of Trinidad and Tobago. The Chairman of the 11th Heads of London Heads of Mission was Ambassador Dr Mohamed I. Shaker, Chairman of the Egyptian Council for Foreign Affairs. HE Professor George B. Kirya, then, High Commissioner of Uganda and Doyen of the Diplomatic Corps, was Co-Chairman of the Assembly. The 11th Heads of Mission Assembly received messages from His Excellencies Mr Leonid Kuchma, President of Ukraine and H.E. Dr Arthur N.R. Robinson, President of the Republic of Trinidad and Tobago. "Nuevo Mundo 2000", published important International Speeches of the Heads of State of Ukraine, The Republic of Trinidad and Tobago and Mr Jiang Zemin, President of the People's Republic of China. 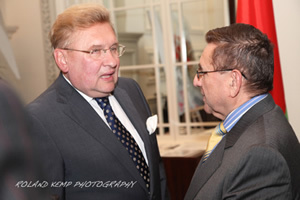 An event marking the 65th anniversary of the death of a Czechoslovak statesman and diplomat at the Embassy of the Czech Republic, 7th March 2013. H.E. Mr Michael Zantovsky, Ambassador of the Czech Republic in the UK welcome the guests and authorities participating in this diplomatic evening. 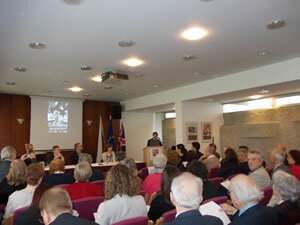 The Second Part of the conference was dedicated to discuss Jan Masaryk as diplomat and soldier during the First War World and his participation as diplomat during the pre Second War World until his death in 1948. Opening remarks by H.E. 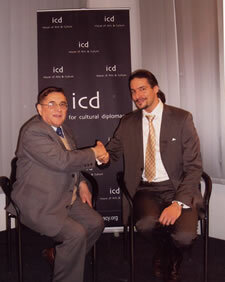 Mr Karel Schwarsenberg, Minister of Foreign Affairs of the Czech Republic. Coffee time at the Conference. Mrs Jana Prikrylova, 3rd Secretary (Political Affairs) Embassy of the Czech Republic and J.R. Monroy, Professor Emeritus, UCH, Founder and Chairman LACCS-UK-UK, Expert in Latin American Education to the Assessment Committee, EDU. Prof. J R Monroy, Chairman LACCS-UK is welcomed by H.E. the Ambassador of the Republic of Bulgaria and Mrs Nadya Ivanova Dimitrova, at the Ambassador Mr Konstantin Stefanov Dimitrov's residence. 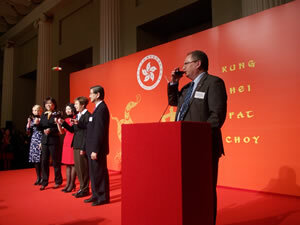 On Wednesday, 20 February 2013 from 5.00pm to 7.00pm the Hong Kong Economic and Trade Office, London, and Hong Kong Special Administrative Region Government with the support of Hong Kong Trade Development Council & Hong Kong Tourist Board, celebrated at The Banqueting House, Whitehall, London SWIA, the Chinese YEAR OF THE SNAKE. Ms Erica Ng, Director General, Hong Kong Economic and Trade Office, London welcome the distinguished guests and gave speech about Hong Kong successful economic, business and cultural achievements. Ms Erica Ng, Ms Linda Lai, Special Representative for Hong Kong Economic & Trade for the European Union and members from Hong Kong Trade Development Council and Tourist Board. 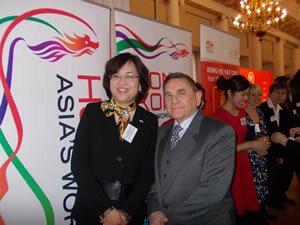 Ms Linda Lai welcome to Professor J.R. Monroy to the reception at The Banqueting House. 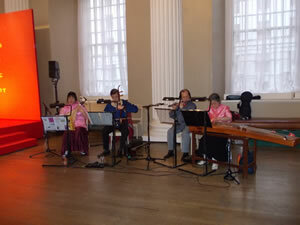 A traditional Chinese ensemble entertaining the evening. 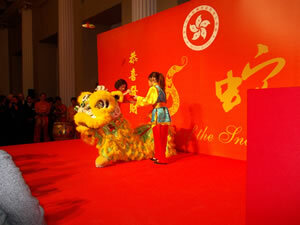 The Toast for the Year of the Snake. 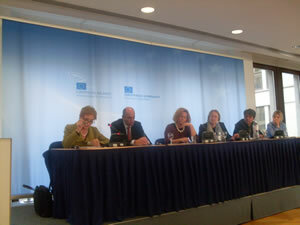 Center: Ms Linda Lai, Special Representative for Hong Kong Economic and Trade Affairs of the E.U. next Ms Erica Ng, Director General, London and members of the Council and Tourist Board. H.E. 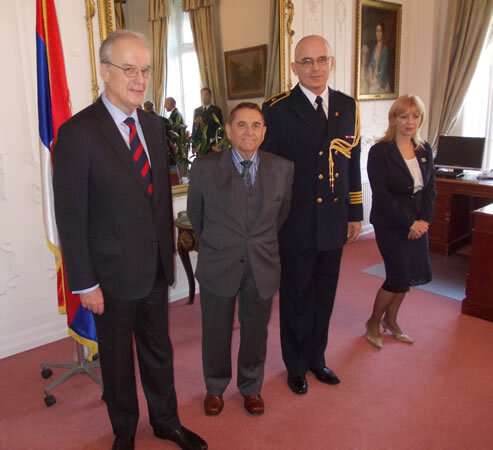 Dr Dejan Popovic, Ambassador of the Republic of Serbia at the Court of St. James's, Professor J.R.Monroy, Chairman LACCS-UK, Captain (Naval) Kikola Lunic and Mrs Nevena Lunic. 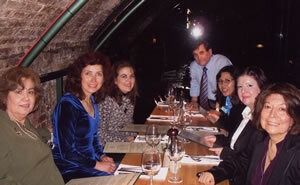 Prof. J.R. Monroy Professor Emeritus UCH, was invited by H.E. 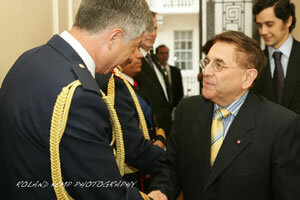 Dr Dejan Popovic to attend the celebration of the Republic of Serbia National Day, on Tuesday 19th February 2013. Prof. J.R.Monroy presented a copy of the First Finnish Concert Programme of Classical guitar at the Purcell Room by Timo Korhonen, to H.E. Mr Pekka Huhtaniemi, Ambassador of Finland at the Court of St. James's. The concert was held on Tuesday 25th March 1993. 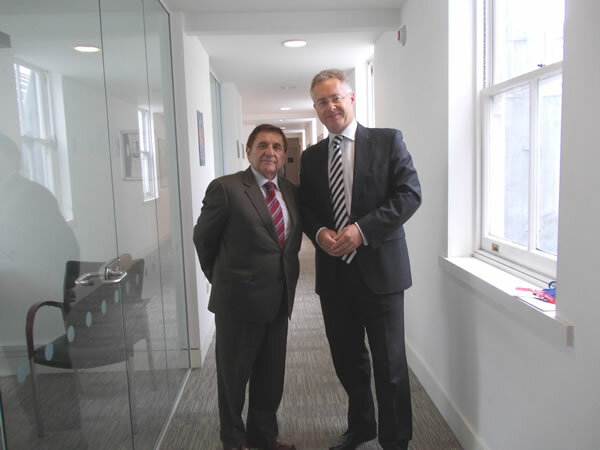 Professor J R Monroy, Founder and Chairman of LACCS-UK-UK, visited H.E. Mr Pekka Huhtaniemi, Ambassador of Finland at his office in London, the occasion was the 20th Years Anniversary of the first concert of Finnish classical guitar at the Purcell Room, Southbank Centre. On Tuesday 25th March 1993, Timo Korhonen, established the Finnish classical guitar series in LACCS-UK, introducing music by the Finnish composer Harri Suilamo (1954), a contemporary composer born in Uskela, Finland on 22nd March 1954. His piece entitled "Anfang... for guitar, 1966 fp in GB", it is a set of four miniatures based on Prelim written in 1994 for two guitars. J. Sylvester, then, wrote in the concert programme: "The piece is founded on the use of idiomatic musical resources that come naturally to the guitar in slightly the same way as, say on a more professional scale, the Preludes and Etudes by Heitor Villa-Lobos. Timo Korhonen debut at the Purcell Room, includes two more gigantic master pieces for the classical guitar: "Royal Winter Music, The First Sonata on Shakespearean Characters for Guitar, 1975-76" by Hans Werner Henze and "Douze Etudes Pour La Guitare, Manuscript Version, 1928, by Heitor Villa-Lobos. The first Finnish guitar concert in LACCS-UK 's Series at the Purcell Room, was under the patronage of H.E. Mr Pertti Salolainen, then, Ambassador of Finland at the Court of St. James's. In addition Timo Korhonen became one of the most distinguished and versatile Finnish classical guitarist and his contribution to the music is today recognised in Finland and around the world. 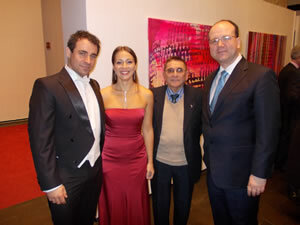 Soprano Adriana Kucerova and Tenor Filip Tuma were acclaimed by the guests for their brilliantly performance. 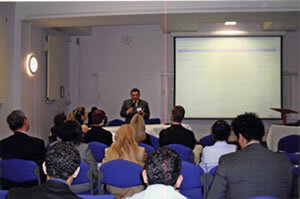 Professor J.R. Monroy, Founder and Chairman LACCS-UK-UK was invited by H.E. 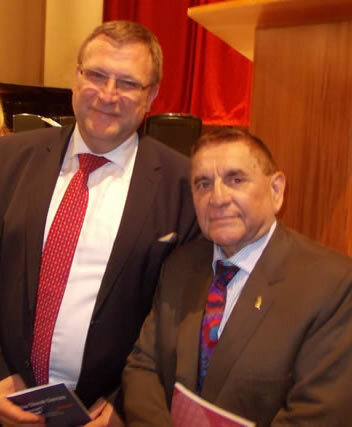 Mr. Miroslav Wlachovsky, to attend the celebration of the 20th Anniversary the Slovak Republic and the establishment of diplomatic relations between the Slovak Republic and the United Kingdom. 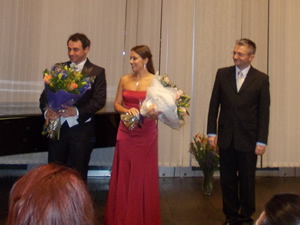 A memorable recital of Slovak, European songs and a selection of arias from the Bel Canto Traditions were brilliantly performed by Adriana Kucerova and Filip Tuma, soprano and tenor respectively. Both opera singer were graduated at the Academy of Performing Arts and the State Conservatory in Bratislava. They were accompanied by virtuoso pianist Robert Pechanec. 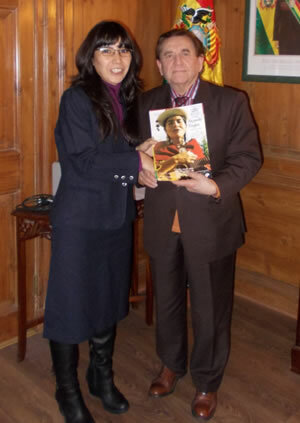 On Thursday 7th February 2013, Professor J. R. Monroy visited the Embassy of the Republic of Bolivia, to present to Ms Veronica Paola Melendres Argote, Charge d' Affaires, a copy of the programme of the First Concert of Bolivian Music held on the 18th March 1993 at the Purcell Room, Queen Elizabeth Hall, Southbank Centre. 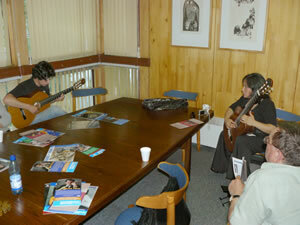 To commemorate the 20th Anniversary of the first Bolivian concert at the SBC, LACCS-UK will continue to support and promote Bolivian music with another special programme in 2013. 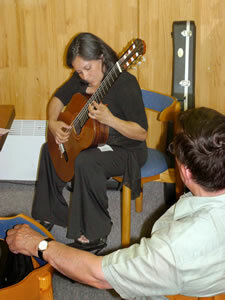 In the meeting Prof J.R. Monroy emphasised the artistic personality of Luzmila Carpio, a quechua descendant of an ancient Amerindian people, better known in Europe as the nightingale of the Andes, she was accompanied by Heriberto Santiago Murillo, playing Andean native instruments such as: zamponas, quenas, charango, kamachena, bombo, tarka, etc. Luzmila Carpio had a great artistic impression on British audiences at the SBC. Ms Veronica Paola Melendres Argote, Charge d' Affaires, Embassy of Bolivia, thanks Prof. J.R. Monroy, Chairman LACCS-UK, for his kind attention to celebrate the 20th anniversary of the first Aymara and Quechua concert at the SBC. 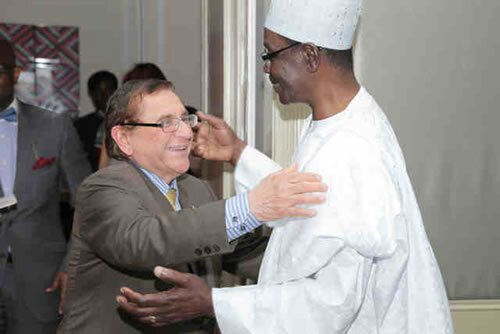 On Thursday 17th January Professor J. R. Monroy, was received by Jamaican High Commissioner H.E. Aloun Ndombet-Assamba at her Excellency office, during the meeting Prof. J. R. Monroy presented a copy of the diplomatic publication, "Nuevo Mundo 2000", (New World 2000), 1991 edition, which was published on the occasion to Commemorate the V Centenary of the voyage of Christopher Columbus, to the Caribbean Islands and to welcome the opening of the European Single Market in 1992. 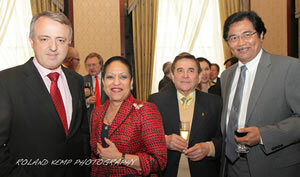 This diplomatic celebration was co-hosted by H.E. Mrs Ellen Gray Bogle, C.D. Jamaican High Commissioner, H.E. General Gary Prado S. Ambassador of Bolivia and H.E.Baron Hermann von Richthofen, Ambassador of the Federal Republic of Germany. The Heads of Mission Assembly received messages of greetings by the Rt Hon Peter Lilley MP, then Secretary of State for Trade and Industry, and by the Heads of States, Rt. Hon Michael Manley, P.C., MP Prime Minister of Jamaica, H.E. 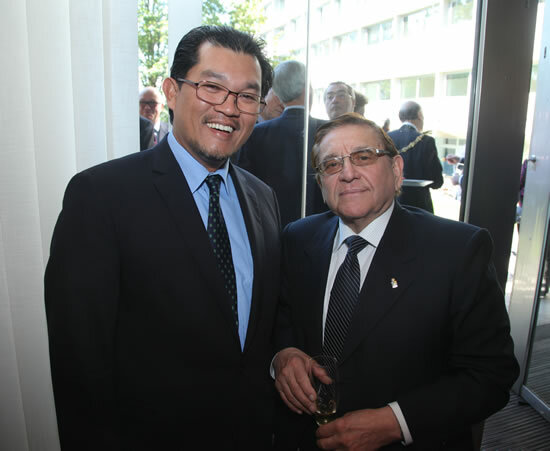 Lic Jaime Paz Zamora, President of the Republic of Bolivia, and by Herr Hans-Dietrich Genscher, Minister for Foreign Affairs. 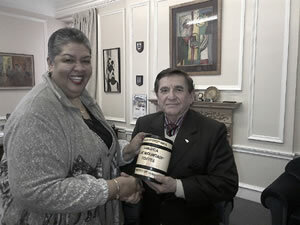 His Excellency Aloun Ndombet-Assamba presented to Prof. J. R. Monroy with a nice small barrel of Jamaican Blue Mountain Coffee. (Product of Jamaica). "The Power of the Arts and Culture to Promote Democracy and Global Peace". 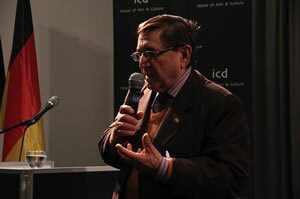 Professor J R Monroy, Founder and Chairman of LACCS-UK-UK was invited to attend to the ICD Annual Conference on Cultural Diplomacy 2012, to discuss the subject "The Power of the Arts & Culture to Promote Democracy & Global Peace". "The Power of the Arts and Cultural to promote Democracy and Global Peace" One of the main panel of discussion: Moderator: British Ambassador Anthony Russell Brenton Members of the panel were: Minister Hassan B. Diab, The Hon. Erna Hennicot Schoepges, Professor Dr Mark Aspinwall, Professor Dr John M.Hobson, Professor Dr Staak Koenis, Professor Dr Ovidiu Pelican and Mr Mark D. Donfried, Director of ICD. Prof. Colin Evans, Commissioner of EDU Administrative Office, Brussels and Prof J R Monroy, Founder and Chairman LACCS-UK-UK. 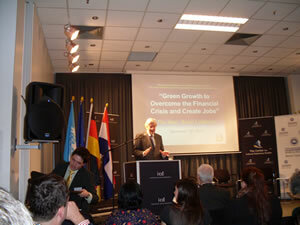 "Green Growth to overcome the Financial Crisis and create jobs" Speaker, The Hon. Ruud Lubbers, Former Prime Minister of the Netherlands, Former UN High Commissioner for Refugees. 15th December 2012. "Europe and Russia: Cultural Soul Mates or Competitors?" 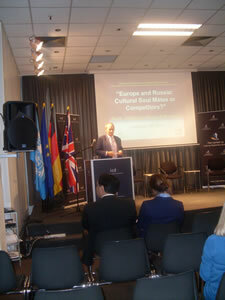 Speaker, Ambassador Anthony Russell Brenton, ICD Advisory Board Member, Former British Ambassador to Russia. Prof. J.R. Monroy was interviewed by the Department of PR & Communications- ICD International by Rosie Vilnius and colleague. The the interview was focussed in Latin American Culture and how LACCS-UK has been successfully presenting projects for the European audiences. 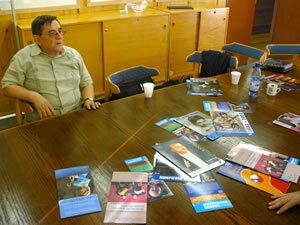 Prof Monroy explained that LACCS-UK is a pioneer organisation promoting cultural ties between Europe and the New World. LACCS-UK experience of 30th Years working in the field of Cultural Diplomacy in London, has been recognised by Her Majesty the Queen and by many Heads of Mission accredited at the Court of St. James's. LACCS-UK has created a unique Latin American cultural programme contributing to a more comprehensive understanding of the real cultural values of Latin America. LACCS-UK identifies some specific issues related to the mutual cultural understanding between Europe and Latin America, among them I can mention, to create a permanent interchange of artists and intellectuals of both regions, a more cohesive work of the E.U. and Latin American institution related to Higher Education and culture. 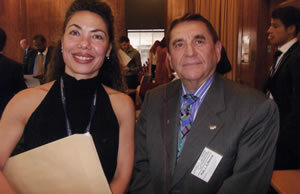 J R Monroy, Professor Emeritus UCH, Founder and Chairman LACCS-UK-UK, with Miss Elvira Gonzalez-Valles (Spain), Head of Programme , Press, PR and Multimedia, video interview. J. R Monroy, Professor Emeritus UCH, giving his lecture on the subject: "Political Power and Cultural Identity in Latin America". Prof. J R Monroy concluded his lecture saying: " That Latin American countries are today better prepared intellectually and politically, in finding a real solution to their cultural identities; to open the door for economic prosperity; to understand that the government must provide equal social and economic benefits for the countryside, industrial, mining and city labourers. Today freedom and democracy are principles rooted in the consciousness of a new generation of intellectuals, professionals, middle and working classes. In short, the economic and cultural progress only will be possible with the participation of the people and with the genuine leadership of political cadres capable to interpret the enlightenment of the Nation". 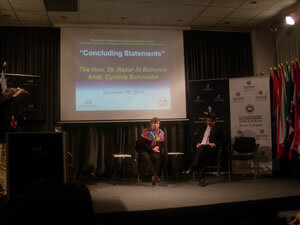 The Berlin Conference ended with Concluding Statements by Ambassador Cynthia Schneider IDC Advisory Board Member, Distinguished Professor in the Practice of Diplomacy, Georgetown University, Former USA Ambassador to the Netherlands and Hon. 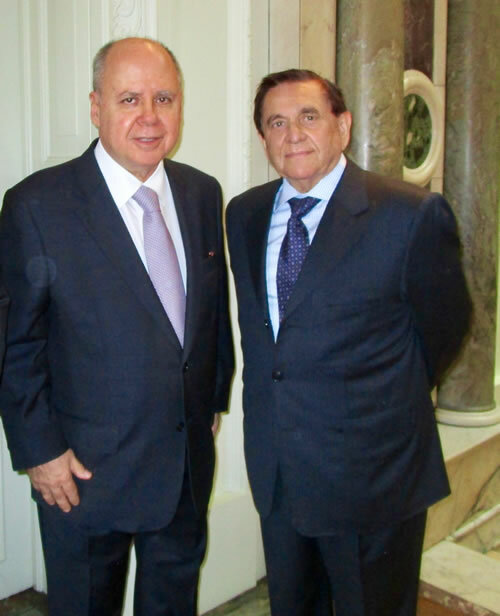 Dr Nazar Al Baharna, ICD Advisory Board Member, Former Foreign Minister of Bahrain. A ICD documentary about Islam Arts and Culture. The question was how civilisations influence each other? Mr Mark D. Don invited Prof. J R Monroy, Chairman LACCS-UK-UK and Ambassador and Former Minister of Foreign Affairs of Turkey, The Rt Hon. Yasar Yakis to attend a session of the Conference "City in Europe" organised by the European Parliament. First on the left : The Hon. Erna Hennicot Schoepges, Vice President of the ICD Advisory Board, Former Luxembourgian Minister of Culture and Religious Affairs. 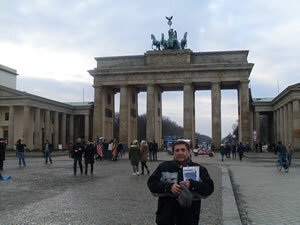 Professor J. R Monroy at the Brandenburg Gate, saying a farewell to the historical capital city of Berlin. December, 2012. 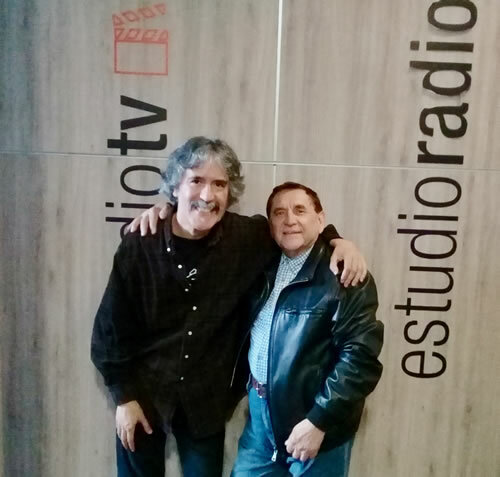 J R Monroy was interviewed by Oscar Ohlsen, presenter of the radio programme 'Guitar', at Radio Beethoven in Santiago,Chile. The interview was about LACCS-UK Pearl Jubilee in 2013, 30th years Anniversary promoting in London Latin American classical music, with emphasis in new classical guitar music by European and Latin American composers. A moment of enjoyment after the interview as the presenter Oscar Ohlsen and Jose Oplusitle, Radio controller of Radio Beethoven, had the opportunity to seeing one of LACCS-UK Chilean concert programme in London. Emeritus Professor J R Monroy, Chairman LACCS-UK - UK , met Dr Larissa Dmitrieva, First Deputy Chief Representation of the Government of Ivanovo Region at the Trade Delegation of the Russian Federation, London 13th November 2012. 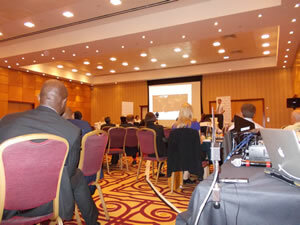 LACCS-UK ATTENDED CONFERENCE AT MARRIOTT LONDON HEATHROW. Programme - Day 2. Professor J R Monroy, Founder and Chairman LACCS-UK-UK, in his speech related to the topic: 'The way forward in energy-energy security and climate change: advancing the global environment Agenda", He illustrates a proposal for a new international understanding between the public and private sectors in the global environment. Programme - Day 2. Mr Nick Dunlop, Secretary General, Climate Parliament, talking about his personal experience working in the research field of alternatives and renewable energies in Europe and emerging countries. 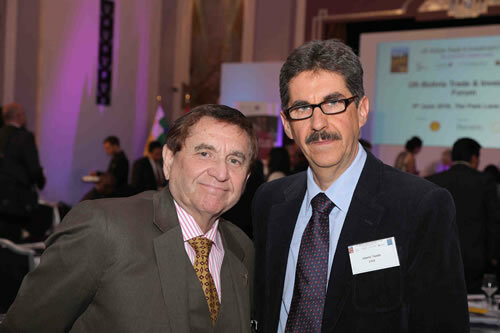 Prof. J. R. Monroy, Founder and Chairman of LACCS-UK attended the Annual conference of The Global Diplomatic Forum, on the 23rd and 24th July 2012, which was held at the Marriott London Heathrow. 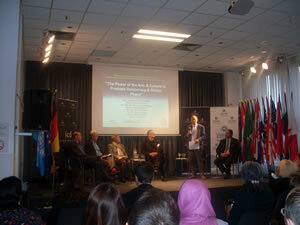 The Title of the conference was: GLOBAL ENERGY SECURITY - THE WAY FORWARD. 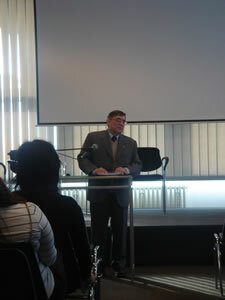 The Conference received a Message from H.E. Dr Boutros Ghali, Former Secretary General of the United Nations. The two days discussions subjects were focus in various related topics to connect global energy and its markets, geo-political regions such as Middle East/North Africa, Russia and Eurasia. Nuclear energy and its geopolitics implications in the modern word, energy security for vulnerable countries, mainly in Africa and Asia, the future balance with renewable and alternatives energies, the climate change and its energy challenges for the 21st century and finally technology innovation related to the political attitude to understand and to improve worldwide the energy security. Prof. J R Monroy had the opportunity to talk about the Latin American experience in the last decade, with regards innovation and security of energies in countries such as Brazil and Chile. 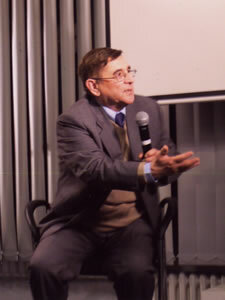 Prof. J. R. Monroy talked about energy and innovation of technology from an historical point of view, and in his analysis he suggest to the conference to explore the idea of an alliance between the industrial countries with the emerging nations to create innovate technology to be applied to an environmental model of sustainable economy. Also to explore an alliance between the private and public sectors, to incentive investments for research in technology innovation. In summary: The conference of GDF 2012 was an important intellectual contribution to understand the complex challenges of the global demand of energy and other alternatives of sustainable energy programmes. Linda Yueh, Economics Editor, Bloomberg, Alice Hibbert, Business Reporter, BBC World, Sophie Long, Presenter BBC, Angus McCrone, Chief Editor, Bloomberg New Energy Finance, Samantha Simmonds, News Presenter, Sky News, Owen Thomas, Anchor, Bloomberg, Dr Christopher Frei, Secretary General, World Energy Council, Phillip Lowe, Director General of Energy, European Union Commission, Dr Phyllis Yoshida, The Deputy Assistant Secretary for International Energy Cooperation, The U.S. Department of Energy, Lord Boswell of Aynho, House of Lords, Parliament of United Kingdom, Bill Farren-Price, Chief Executive, Petroleum Policy Intelligence, Dr Hans Schindler, Former German Diplomat, Programme Director at the Institute of Strategic Dialogue, Dr Shamil Yenikeyeff, Research Fellow, Oxford Institute for Energy Studies, University of Oxford, Dr Armen Sarkissian, Former Prime Minister of Armenia, President of Euroasia House, Paul Spence, Director of Strategy and Corporate Affairs, EDF Energy, Sarah Butler-Sloss, Founder/ Director, Ashden, H.E. Mt Edward Turay, High Commissioner for Sierra Leon, Ali Fassi Fihri, Director General,National Office of Electric, Morocco, Vivien Foster, Sustainable Energy Department, the World Bank, Rushara Ali, Labour Member of Parliament, Bethnal Green and Bow, Pradeep Pursani, Business Director - Breathing Space, Shell Foundation, H.E. Fouad Douiri, Minister of Energy, Morocco, Ryan Hobert, Director for Energy and Climate Change, United Nations Foundation, Christine Lins, Executive Secretary, REN21 Secretary, United Nations Environment Programme, Nick Dunlop, Secretary-General, Climate Parliament, Maite Jaureguy Naudin, Director of the Centre for Energy, the French Institute of International Relations, Baroness Worthington of Cambridge, House of Lord, United Kingdom, etc. LSBM 2nd Teaching and Learning Conference at the LU. 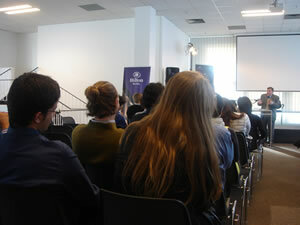 Opening Address: Dr Rosemary Skordoulis (LSBM Principal) LSBM Research Centre, Video Introduction to the Conference. Afternoon Session 2: Panel Discussion Topic: Changing Markets: The Future for Higher Learning Education in a Globalised World"
From left to right: Professor J.R. Monroy, Founder and Chairman LACCS-UK, Mr Aliar Hossain, LSBM, Chair and Mr Mark T. Jones, Director of External Affairs for Park Royal College. HEARTS AND MINDS: CAPTIVITY TEACHING AND INNOVATIVE PEDAGOGIES. The Conference Co-pordinator was Mr Aliar Hossain, PgD Course Leader & MBA Supervisor at LSBM. 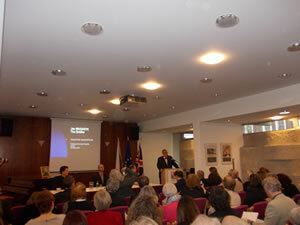 Dr Rosemany Skordoulis (LSBM Principal), addressed and opened the conference. Dr Peter Wynarczyk, Deputy Dean at the Metropolitan Business School, introduced an interesting topic:"Arcademia or Knacademia: Creative Destruction, Dissolution, or Melding", an original approach to the academic learning and to the creative thinking. Mr Vick Krisnan, Barrister and Principal Lecturer in Law and Business subjects, "The growing importance of emotional intelligence as a determination of success in academia", a new method to understand the systematic learning in academia, etc. An interesting panel discussion was the topic: "A Winning Attitude to Teaching: How Innovative Pedagogies can Engage Your Students", with valuable contribution from experienced academics such as Dr Hasanat Hossain (MBE), Mrs Isobel Wood, Mr John Howells, Mr Reza Aboutalebi, and Chaired by Dr Rosemary Skordoulis, brought to the conference valuable conclusions about the academic experience of each panel participant. "Changing Markets: "The Future for Higher Education in a Global World". The participants were Professor J R Monroy, Founder and Chairman, LACCS-UK and Mr Mark T. Jones, Director of External Affairs at the Park Royal College and was Chaired by Mr Aliar Hossain, LSBM. Professor J.R. Monroy, analyzed the subject from a sociological and historical point of view taking into consideration the past and present changes in both the academic thinking and the structure of the university system. He explained how the current high education is under the control of a powerful market and for this reason is unable to fulfil its missions. However, a transition to a new multinational University system will bring equally risks and challenges for the consolidation of a new international university model for the 21st century. Professor J.R. Monroy illustrated how the traditional educational pyramid was inverted to create an academic explosion around the world, not having the standard of quality-knowledge in the teaching profession and without social responsibilities for the national community. He concluded saying that today we are having a global crisis, and we are waiting to build the right model of a higher learning institution, that is to say, to visualize the future "utopia" of a free and multicultural University. With regard to the Latin American University System, Professor J.R. Monroy refer to the Chilean case, in which in spite of several changes in its bureaucratic administration, the University have not been able to contribute to the economic growth with the purpose to incentive the creation of a new "know-how" to be applied in the industry and businesses. The aim is to innovate with a new learning systems, to make easy an alliance with the State and industrial sectors, to up grade professional standards intended for competing successfully in the international academic markets, to become independent from the world of high learning centres. The University system in Chile needs a regulator to advice in the planning of the number of graduates in liberal, scientific and technological careers, accordingly with the social and economic necessities of the country. The Nation is in need of a University system capable to respond to the challenges of the 21st century, or the contrary, I can say, that the Public University will fail to resolve its own academic problems and will become an stagnant High Learning Institution. In the garden of the H.E. The Ambassador of Russian Federation Residence: Prof. J R Monroy, Chairman, LACCS-UK and Mr Thomas Bergeson, Brigadier General, United States Air Force, Senior Defence Official & Defence Attache, Embassy of the United States of America. 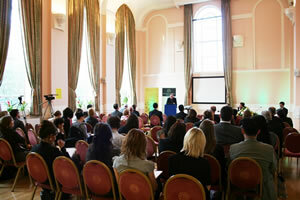 Prof J R Monroy, was invited by the Commercial Office of the Brazilian Embassy in London to attend the III Brazil-UK Oil & Gas Meeting: Co-operation in Human Resources & Skills Development, held at the Townhouse Aberdeen City Hall, Scotland on 10th May 2012. The meeting was well attended by more than one hundred companies and institutions related to training of human resources in the oil & gas industries in Brazil. Opening remarks were given by Mrs Valerie Watts, CEO, Aberdeen City Council, H.E. Mr Roberto Jaguaribe, Ambassador of Brazil and The Rt Hon Michael Moore, MP, Secretary of State for Scotland. In summary, the III Meeting Brazil-UK Oil & Gas, was focussed in the training and re-training of human resources for the Brazilian oil & gas industries, the seminar was well represented by Brazilian governmental institutions and private companies dedicated to improve the technical skills and professional learning with the aim to satisfied the high demand of manpower for the Brazilian energy industries in the States of Rio de Janeiro and Rio Grande do Sul. 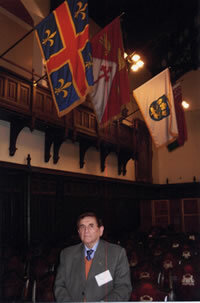 Prof. J R Monroy, at the Aberdeen County Hall, impressive decorative halls of the 17th century, timber panelling, fine decorative timber hammer-beam roof and minstrels gallery, one with Scottish heraldic shields and other with timber pews, gallery and benches. The display of the flemish Medieval flag, a reminiscence of the trading ties between Aberdeen and the Low Countries in the past centuries. Prof J R Monroy, (LACCS-UK), and Senhor Paulo Buarque Guimaraes, Superintendente, National Organization of Petroleum Industry (ONIP). MONDAY 30th APRIL 2012, 47 PORTLAND PLACE, LONDON. W1B IJH. H.E. Dr Muhamet Hamiti, Ambassador of the Republic of Kosovo, H.E. 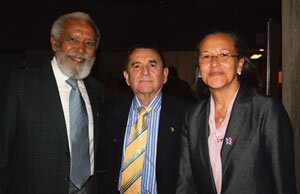 Ms Kamela Palma, Belize High Commissioner, Prof. J R Monroy, Chairman, LACCS-UK and H.E. Mr T. Mhanza Thayeb, Ambassador of the Republic of Indonesia. At the Embassy of the Republic of Bulgaria. Mr Urs Schmid, Minister, Embassy of Switzerland and Prof. J R Monroy, Chairman, LACCS-UK. Reception at the Corinthia Hotel, London, 16th Feb, 2012. Celebration of the Independence of the Republic of Kosovo. Left: Councillor Aslam Choudry, The Worshipful The Mayor of the London Borough of Brent and Professor J R Monroy, Chairman, LACCS-UK. Left: Prof. J R Monroy, Chairman, LACCS-UK, Mr Campbell Gordon, Partner Optimus Capital, and Cllr, Chris Edge, London Borough of Merton. The Churchill, 30 Portman Square. Mr Peter Taylor, Insurance Solutions Limited, Prof. J R Monroy, Chairman LACCS-UK, Mrs Maria Rosa Picart De Francis, and Mrs Taylor. The University Reform movements in Latin America are connected to a process of social changes from rural to a semi-industrial society. learning and teaching methods were traditional and scholastic, without consideration by the authorities to introduce new methods and ignoring a massive illiterate population. The problem of illiteracy in young people was part of the contradiction between countryside and the emergency of the modern cities (urbanism as an incentive to social mobility), middles classes. The Universities as educational institutions, reflected a period of transition to a new model of learning institution, it reflects the intellectual capacity of the middle classes to reform the University, to end with the oligarchy learning institution and to reaffirm a new concept of democratic education. The new high learning institution was denominated University Reform, and it was inspired and supported by the middle classes, the intelligentsia and the student movements, who patronized a liberal approach to teaching and learning, with a new concepts, such as University autonomy, co-government, academic freedom, etc. The reformist were a dynamic force to modernize the traditional methods of teaching and learning in the High Education system in Latin America. Mr Alejander Khvtisiashvili, Senior Counsellor Embassy of Georgia, Mr Riaan Jonk, Managing Director, London School of Bussiness and Management, Dr Rosemary Skordoulis, College Principal, LSBM, and Prof. J R Monroy, LACCS-UK, Chairman. Dr Rosemary Skordoulis, introduced Prof. J R Monroy and his Lecture: A view of the Academic Learning and Teaching in Latin Universities (Pre and Post Reforms). Prof. J R Monroy, explained his academic experience in teaching and learning, and described the evolution of the learning in the Latin American Universities, and how teaching, learning and higher education in Latin America are conditioned by social, cultural and economic factors, creating sometimes, crisis in National Education Systems. 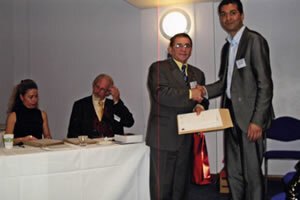 Prof. J R Monroy, congratulated and received a Diploma, for his academic contribution by Prof. Aliar Hussain, Conference Co-Ordinator, London School Business and Management. RECENT VISIT TO MALTA AND VALLETTA. Professor J R Monroy, Chairman LACCS-UK, recently received an invitation from Dame Francoise Tempra, Founder of the MALTA International Art Biennale, to give a lecture on the subject, "Latin America: what do we learn from its 200 years of Independence". 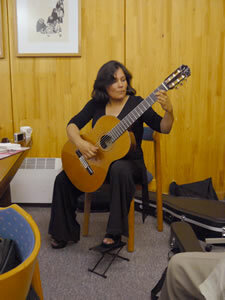 The 30 minutes talking was also preceded by a recital by Bolivian pianist Rossana Tamarri. 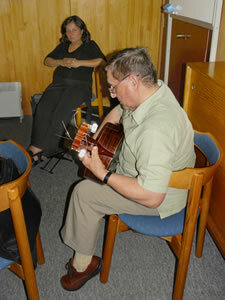 The evening was an opportunity to listen music and to reflect on Latin America history. An interesting occasion to enjoy Music, art and History. 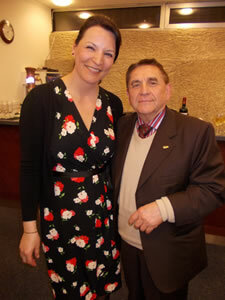 Professor J R Monroy had the opportunity to meet in Valletta, H.E. 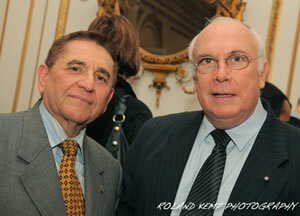 Dr Michael Refalo, former Malta High Commissioner at the Court of St. James's in London. NATIONAL DAY CELEBRATION AT THE BOLIVAR HALL. Prof. J R, Monroy is welcome by Mr Alvaro Sanchez, Deputy Head of Mission. Dr Aquiles Alencar Brayner, British Library, Dr Elizabeth Cooper, Curator Latin American Collection, British Library and Prof. J R Monroy, LACCS-UK. Prof. J R Monroy, Chairman, LACCS-UK, greet to H.E. 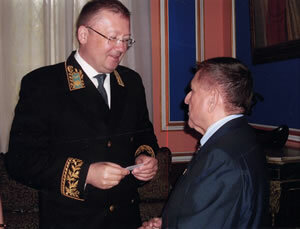 Mr Aleksandr Mikhnevich, Ambassador of the Republic of Belarus. 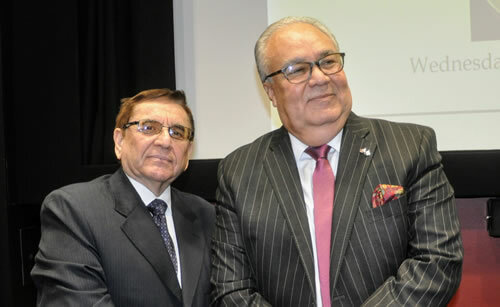 >From left to right: Mr Sirous Sajjadi, First Secretary, Embassy of the Islamic Republic of Iran, and Prof. J R Monroy, Chairman LACCS-UK. 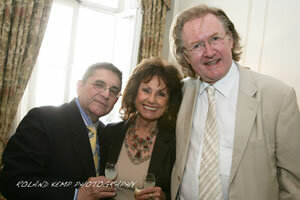 Mrs Maria Rosa Picart De Francis, Mr Reginald Alan Francis and Prof. J R Monroy. On the occasion of the Third Anniversary of the Declaration of Independence of Kosovo, at the Institute of Directors, Pall Mall, London SW1Y 5ED. 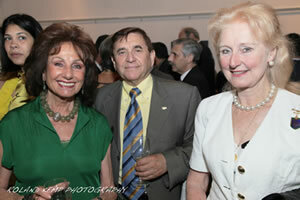 Prof. J R Monroy (left), Terry & Geraldine Alliston (Smile International). Occasion of The Anniversary of the Victory of the Islamic Revolution in Iran. 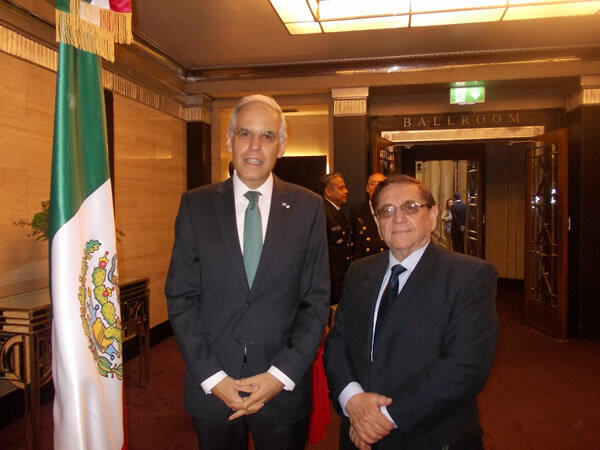 Professor J R Monroy, Chairman LACCS-UK and H.E.Mr Acisclo Valladares Molina, Ambassador of Guatemala at the Embassy of the Islamic Republic of Iran. The Austrian Ambassador and his family enthusiastically supported the 200th Years Independence Anniversary of Latin America at the South Bank Centre. 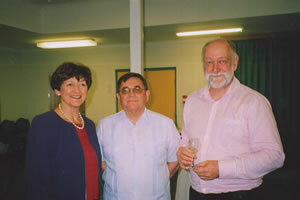 Prof. J R Monroy (centre), left, H.E. Mrs Maria Teles carreira, Ambassador of Angola and Mr Mario Afonso de Almeida, enjoying the music and friendship of the Bicentennial Celebration of Latin America at the SBC. CHILEAN NATIONAL DAY AND CELEBRATION OF THE CHILEAN BICENTENNIAL AT H.E. THE AMBASSADOR OF CHILE RESIDENCE, THURSDAY 16th SEPTEMBER 2010. 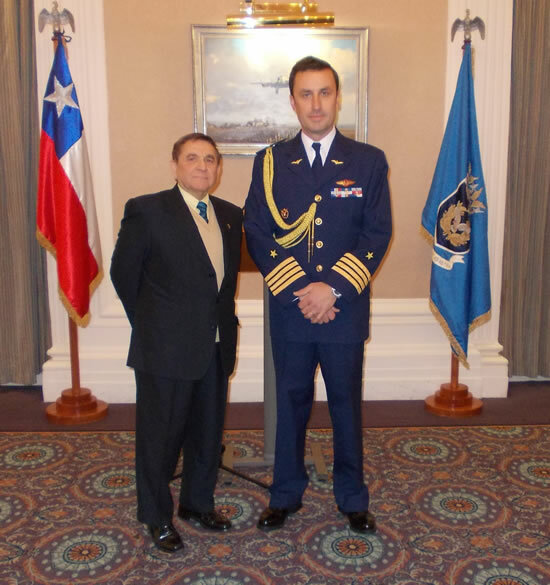 Group Captain Claudio Ibacache, Air Attache, Embassy of Chile, welcomes Professor J R Monroy, Chairman of LACCS-UK at the Chilean Ambassador's Residence. 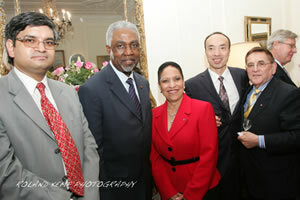 Dr Carl Roberts, High Commissioner of Antigua and Barbuda, Her Excellency Ms Kamela Palma, Belize High Commissioner, Lt Colonel Cao Zhenhua, Air Attache, Embassy of the People's Republic of China and Prof. J R Monroy. 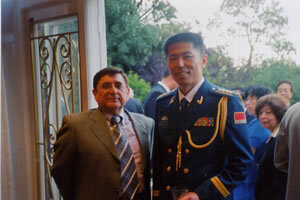 Lt Colonel Cao Zhenhua, Air Attache, Embassy of the People's Republic of China and Prof. J R Monroy, Chairman of LACCS-UK. 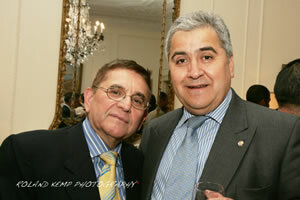 Mr Claudio Rojo, Consul General, Embassy of the Republic of Argentina and Prof. J R Monroy, Chairman LACCS-UK. 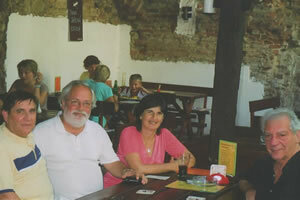 Professor J R Monroy, Mrs Maria Rosa Picart de Francis and Professor Beravale. 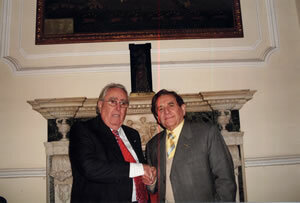 Professor J R Monroy, Chairman LACCS-UK and Mr Jaime Aguilera Guerra, President of Instituto O'Higginiano, London. VISIT TO BOLIVIA : LA PAZ, August 2010. 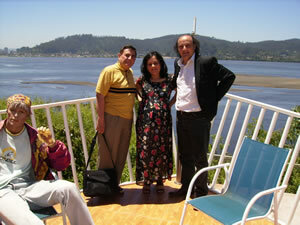 Professor J R Monroy, visited in August 2010 Bolivia. 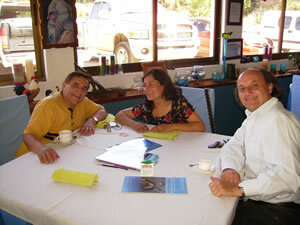 He was invited in La Paz by Lic. Maria Esperanza Tellez Laguna, Executive Director of the National Conservatoire of Music, to talk about his own personal experience working in the field of management in music for more than two decades at the most important public venues in London such as South Bank Centre, Barbican Hall, St. John's Smith Square, Wigmore Hall and others. 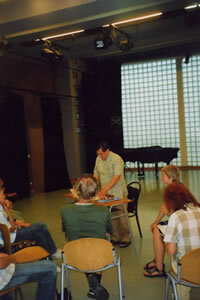 Prof. Monroy's own management experiences were well received by the students and his ideas were considered very valuable to learn how to introduce new music into traditional audiences and to organise a programme to entertain and to educate the public with music by national composers. The talk ended with participation of several students, making their questions to Prof. Monroy and evaluating the need of management system as an important role for music students in General education. Lic. 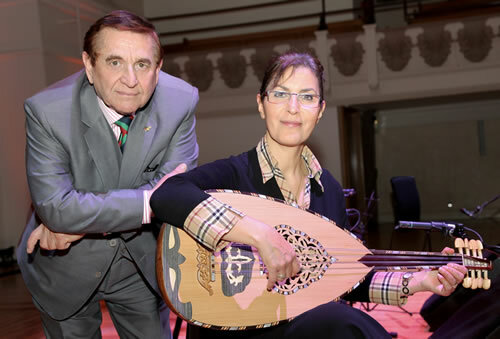 Maria Esperanza Tellez Laguna, Executive Director, National Conservatoire of Music, La Paz and Prof. J R Monroy, Chairman LACCS-UK, With several samples of Concert Programme With Bolivian Music, presented in London since 1984 onward. 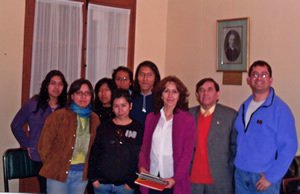 A group of Bolivian students at the National Conservatoire of Music, La Paz with (left), Lic. 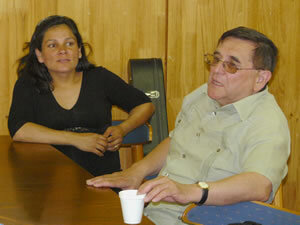 Maria Esperanza Tellez Laguna, Prof. J R Monroy, LACCS-UK, Chairman and Prof. of Guitar Marcos Puna. With the Thai Ambassador in Santiago, Chile. 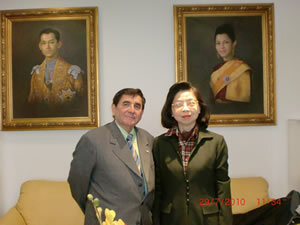 Professor J R Monroy, Chairman of LACCS-UK in his recent visit to Santiago, was received by Thai Ambassador H.E. Vipawan Nipatakusol, at the Royal Thai Embassy in Santiago, Chile. Professor J R Monroy paid a courtesy visit to H.E. Ambassador Vipawan Nipatakusol and informed that LACCS-UK is promoting traditional Thai music in Latin America and also that HM The King of Thailand Suite was broadcasted by radio Beethoven in the programme "Guitar", in which Prof. Monroy was interviewed by Oscar Ohlsen. It is important to mention that Radio Beethoven and its programme "Guitar", is the first Latin American radio to broadcast H.M. The King Bhumibol Adulyadej's music. This cultural initiative was an important contribution to make known to the Latin audience the rich and millenarian culture and music of the Kingdom of Thailand. At the same time Prof. J R Monroy, explained to Her Excellency Madame Vipawan, the exciting project to premier H.M. King Bhumibol Adulyadej's music in a concert to be held on 28th October at St. John's Smith Square in London, in the presence of HE Ambassador Kitti Wasinondh, and members of the Diplomatic Corps and friends of Thailand in the U.K. A young Thai classical guitarist Ekachai Jearakul, was selected to premier in London H.M. The King of Thailand Suite. 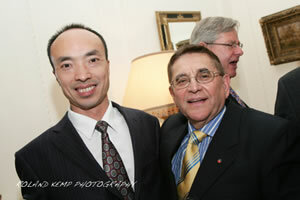 In the photos below, Prof. J R Monroy with H.E. Ambassador Vipawan Nipatakusol. 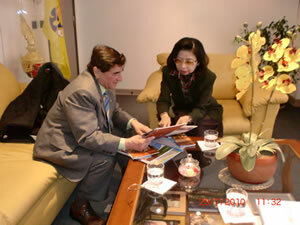 Her Excellency congratulated Prof. J R Monroy for his brilliant initiative to bring Thai traditional music to Chile. 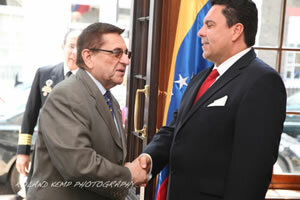 RECEPTION TO CELEBRATE THE NATIONAL DAY OF THE BOLIVARIAN REPUBLIC OF VENEZUELA. Prof J R Monroy, LACCS-UK Chairman is welcome by H.E. 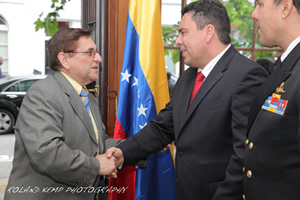 Dr Samuel Moncada, Ambassador of the Bolivarian Republic of Venezuela and Captain Luis Alejandro Ojeda, Permanent Representative to the IMO. 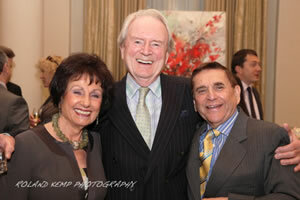 Mrs Maria Rosa Picart De Francis, Former Ambassadress of the Principality of Andorra, Prof. J R Monroy and Miss F.A. Croft. 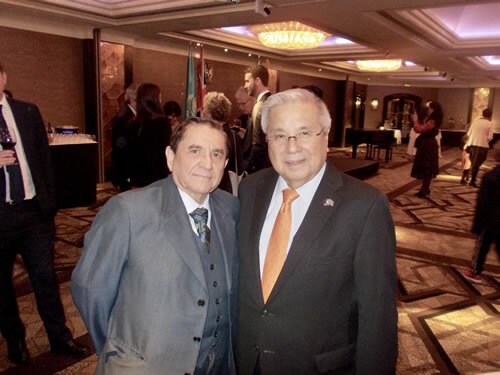 Professor Hovhannes I. Pilikian, American University of Beirut and Professor J R Monroy, LACCS-UK Chairman, enjoyed friendship to celebrate the 199th Years of the Bolivarian Republic of Venezuela Independence. 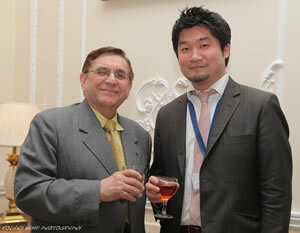 Prof, J R Monroy and Mr Tetsuo Kitada, Second Secretary, Embassy of Japan in the United Kingdom. 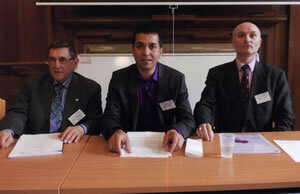 Prof. J R Monroy, Chairman LACCS-UK, HE Mr Sami Khiyami, Ambassador of the Syrian Arab Republic and Mr Nabih Moukayed. 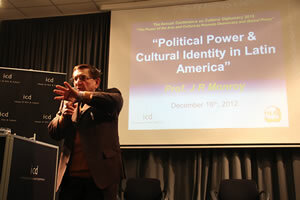 Lecture by Prof. J R Monroy, Chairman and Founder of the Latin American and Caribbean Cultural Society (LACCS-UK). Abstract: Latin America: what can we learn from 200 years of Independence? This lecture attempts to explain how during the development of Latin American history several social and economic processes of 19th and 20th centuries have failed to find practical solutions to the problem of dependency relations between the New World and the industrial countries. A quick analysis of the contradictions between the rural and urban areas, and the role of the middle and working classes which has reformed the traditional society of the 20th century. Also I mentioned cultural dependency and cultural identity as two contradictory social and political attitudes, which Latin America has to face to fulfil its new international role. In Summary : Latin America Bicentennial is a lesson to learn how the new Latin emerging markets will confront the 21st century challenges to improve social, cultural, economic and political life. 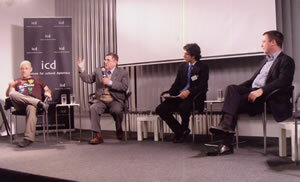 Panel Discussions: Europe Meets Latin America - The Economy and the Culture. Centre: Prof. Mark C. Donfried, Moderator, Executive Director ICD, Prof.Federico Foders, Kiel Institute and Prof. J R Monroy, Chairman LACCS-UK. 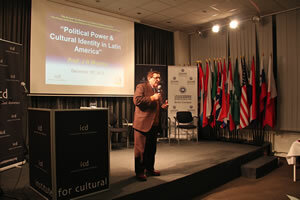 Professor J R Monroy taking part in the panel discussion about Latin American Culture. Left: Dr Matthias S Tantow, Director Galerie Tantow (Kunst aus Lateinamerika), Berlin. Professor J R Monroy talking about the Andean Culture and his own experience with regards the project of Higher Education in the Andean region. Professor Mark C Donfried, Executive Director & Founder of ICD - Institute for Cultural Diplomacy, Congratulated Prof. J R Monroy for his interesting Lecture and active participation in the various Panel-discussions about the Culture in Latin America. 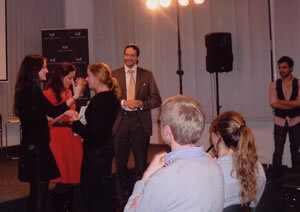 A happy moment for the scholars receiving their Diploma for the attendance of the week conference Europe Meets Latin America - A Forum for Young Leaders. 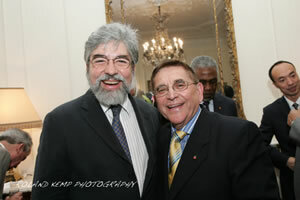 Prof J R Monroy was invited to A CHAMPAGNE & CANAPE' RECEPTION by THE PRESIDENT' S CLUB President: Cllr. John Marshall in the honour of BORIS JOHNSON - MAYOR OF LONDON, held at Norton Rose, More London Riverside, London SE1 at 7.30 pm. 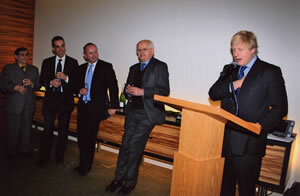 The Mayor of London, Boris Johnson, addressed a select audience from Finchley and Golders Green Conservatives. From left to right: Professor J R Monroy, Chairman LACCS-UK, Mr Reuben Thompstone, Cllr Mike Freer, Parliamentary Candidate for Finchley and Golders Green and Cllr John Marshall. 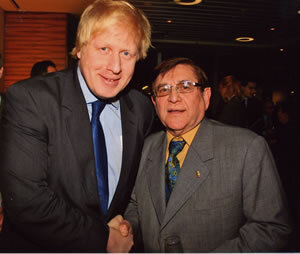 Mayor of London, Boris Johnson, congratulated Prof. J R Monroy for his dedication to promote better understanding of the cultures of Latin America and United Kingdom for more than two decades in London. 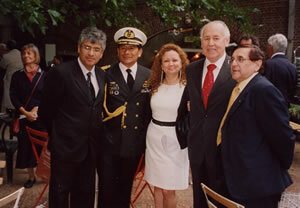 Annual Ceremony of the Embassy of Chile to Commemorate the Birth of Bernardo O'Higgins "Liberator of Chile" at Richmond, August 2009. 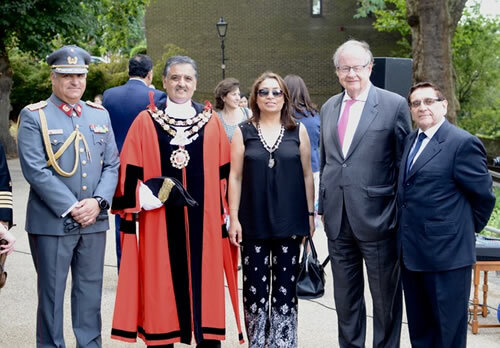 Captain Ronald Quipildor and Mrs Quipildor, Defence Attache, Embassy of Bolivia, HE Rafael Moreno, Ambassador of Chile, and Prof. J R Monroy, Chairman LACCS-UK. H.E. The Ambassador of Bolivia, Mrs Maria Beatriz Souviron, third left and Rossana Tamarri Galarza, Pianist, with Prof. J R Monroy, Juanita Silvestre and Colleagues. Chile National Day at the Ambassador of Chile residence. 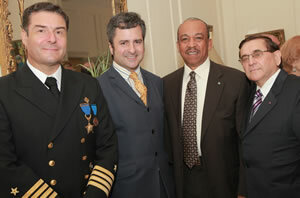 Captain Otto Mrugalski, Maritime Adviser of Chile to the International Maritime Organisation (IMO), H.E. Gilberto Arias, Ambassador of Panama, H.E. Mr Paul Farquharson, High Commissioner of the Commonwealth of the Bahamas and Prof. J R Monroy, Chairman LACCS-UK. 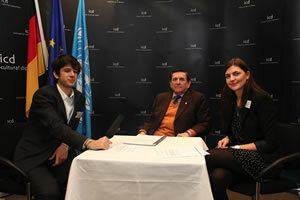 Mr Rodrigo Espinoza, Deputy Head of Mission, Embassy of Chile, H.E. 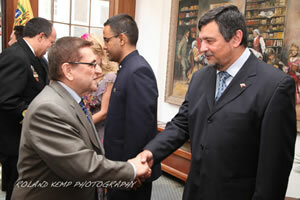 Mr Juraj Zervan, Ambassador of the Slovak Republic, Prof J R Monroy, (LACCS-UK) and H.E. 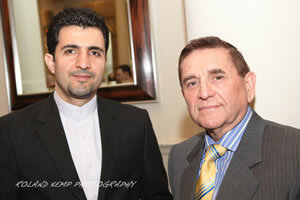 Mr Sami Khiyami, Ambassador of the Syrian Arab Republic. Professor J R Monroy, Chairman LACCS-UK with Senior Colonel, Wang Shujun, Air Attache, The Chinese People's Liberation Army Anniversary, Embassy of the People's Republic of China. 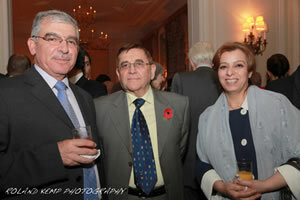 The 86th Anniversary of the Republic of Turkey celebrated at the Ambassador residence in London. Brigadier General Mohammad Farghal, Military Naval & Air Attache, Embassy of the Hashemite Kingdom of Jordan, Prof. J R Monroy and Mrs Farghal. 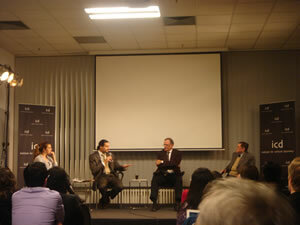 Asia Pacific Panel Discussion: "Some Reflections on Asia/Pacific on TIMES OF CRISIS AND HOPE." Monday 20th April 2009 at 6.30 p.m. 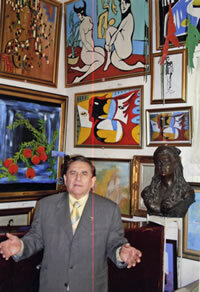 Professor J R Monroy, Founder and Chairman of the Latin American & Caribbean Cultural Society (LACCS-UK). Dr Kerry Brown, Senior Fellow, Asia Programme, Chatham House. Professor Laixiang Sun, SOAS. University of London. Title: Some Reflection on Asia/Pacific on Times of Crisis an d hope. First I explained my own concept of CRISIS which is an attempt to explained it together with the dialectical nature of the development of capitalism and its implications in the evolution of a society either primitive or modern. Some examples were given of how "crisis" in history find new stages of superior level. Secondly this new social or economic order bring hope through communication and trade; with regard to the Pacific region which is two thirds of the population, I mentioned some disadvantages of the Pacific region for future association to free trade and political under- standing, amongst a variety of languages, customs, religions, and cultures. In the second section of the paper I analysed how the Pacific South American countries faced the problem of the opening of the Pacific market and trade and their awakening to the world politics. 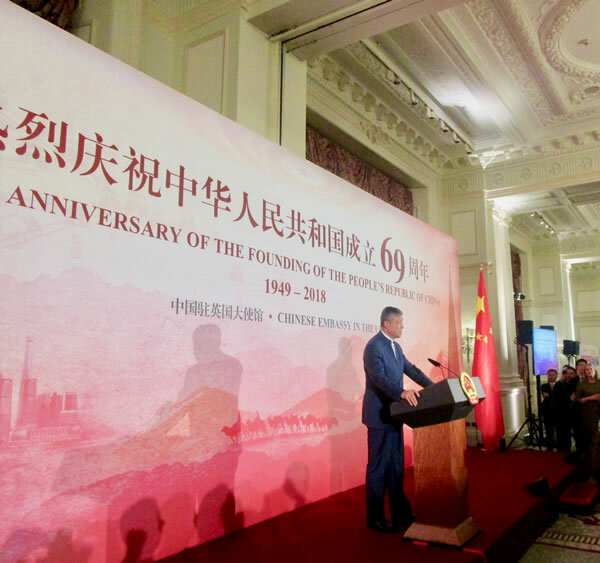 I focussed on the strategic role of China, South East Asia, India and Australia New Zealand, as the main political and economic forces to be considered important for the future development of the Pacific South American countries. I considered the case of Chile, as exceptional for its historical ties to the Pacific region, for its natural geo-political location in the map of the South American continent. I illustrated some samples in which Chile at the end of XVIII century was exploring the possibility of trade with Australia, and later by mid of 19th century, the Chilean trade with California and Australia, via Pacific, and the creation of the first South American merchant navy. Finally, the take over of the Eastern Island, considered the last natural resource of the Polynesia. In summary I concluded that we do no be afraid of the concept of crisis, on the contrary we need to concentrate our thinking in positive experiences and learn from previous world crisis in the past, and specially concentrate our reflection in the future relations of Asia/Pacific and the Pacific Coast of Latin America, in which obviously Chile will play an strategic and valuable role. 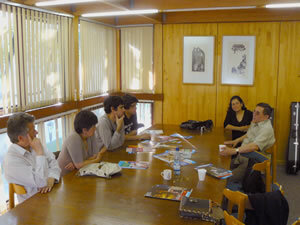 Prof. J. R Monroy, Founder and Chairman of the Latin American and Caribbean Cultural Society (LACCS-UK), visited CHILE in December 2007 to explore ways of co-operation between LACCS-UK and the Chilean Cultural and Educational institutions. From last week of November to December 2007,Prof. 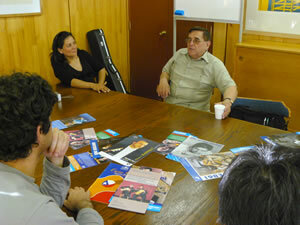 J R Monroy visited several Chilean Universities to explore opportunities for co-operation, specially with Music Department and with special interest to develop the Chilean classical guitar. An interesting proposal project were discussed with the Institute of Music of the Catholic University in Santiago, for 2009-2010. 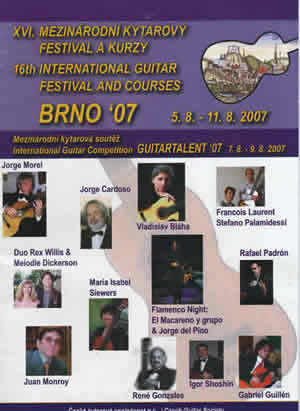 The basic idea was to create a join project for young musicians, to stimulate the learning of new repertoires for the classical guitar and string ensembles with special concerts and music activities abroad. A visit to the University of La Serena, with Dra Catalina Cvitanic Abarca, Director of External Communication, agreed to promote LACCS-UK activities to the students, and to explore future co-operations in join projects for young and gifted musicians. 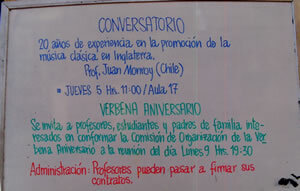 Prof. J R Monroy was invited by the Department of External Communication, University of Bio Bio, Concepcion, to give a talk about LACCS-UK's 25 Years Experience in the field of performing art, in England, and it was an opportunity to met some colleagues of the Music Department, of the University of Concepcion. 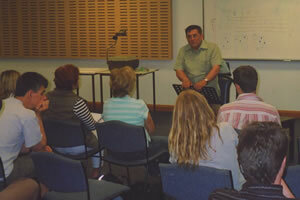 It was agreed that in a second visit in 2008, Prof. J R Monroy will give a Lecture in the subject of "The Praxis of the Music" and "Sociology of the Music". (Focussed in Latin America and Europe). His visit was undoubtedly an experience to learn more about the Chilean musical education with regard to teaching and learning of classical guitar as well as its progress in the last decades, especially in the Northern and Southern regions of the country. 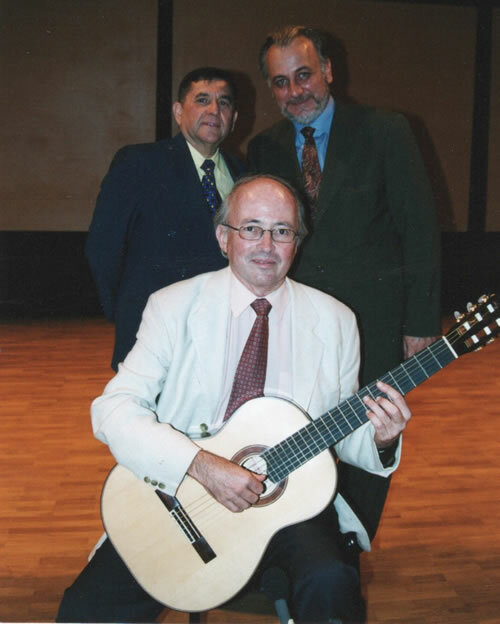 Prof. J R Monroy was warmly welcomed by Professors Alejandro Gallegos, Director of the Music Department, Fernando Lillo, in charge of the Chair of Classical Guitar at the University of Concepcion and Isabel Almeida, Chair of Guitar, at the University of Bio Bio. Finally, following the Chilean tradition to welcome the guest, he was invited to a lovely local restaurant on the border of Bio Bio River, to enjoy a selection of delicatessen prepared with local fishes, meat and aromatic wines. It was really a happy journey! 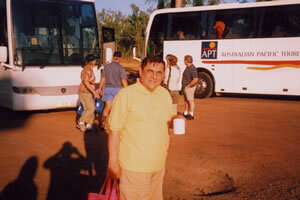 A VISIT TO THE ABORIGINAL LANDS OF KAKADU, NATIONAL PARK, AUSTRALIA. Kakadu National Park is a commonwealth Reserve under the Environmental Protection and Bio-diversity Conservation Act 1999. 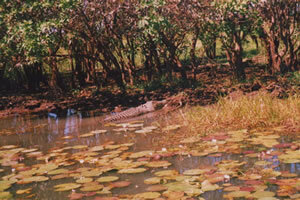 Kakadu is a cultural landscape It was shaped by the spiritual ancestors of Aboriginal people during the Creation Time. A cup of tea to relax for my trip to the land of Aboriginal floodplain language called Gagudju. With my innocent camera I tried to get the sleeping reptile of the freshwater: Crocodylus johnstoni, and Crododilus porosus, Estuarine (saltwater), crocodiles, also found in India, South East Asia and Papua New Guinea. Professor Helen Garnett PSM Vice Chancellor, Charles Darwin University, Professor J R Monroy, Chairman LACCS-UK and Adrian Walter, Dean Faculty of Law, Business and Arts, and Artistic Director. 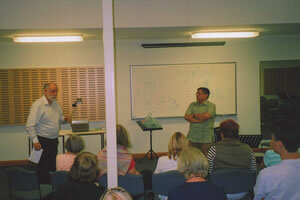 Dean Adrian Walter, introduced Prof. J R Monroy to the lecture THE PRAXIS OF THE MUSIC: LATIN AMERICA. 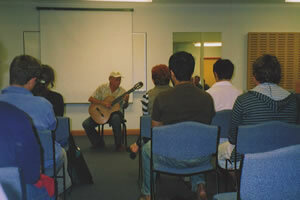 Professor J R Monroy in class on the subject Sociology of the Music: The praxis of the Latin American guitar and the learning of the experience. 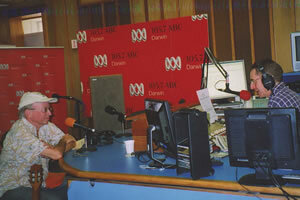 Carlos Barbosa-Lima is interviewed in local Radio Darwin, Australia. LACCS-UK with three legendary South American guitarist of all time! From left to right. 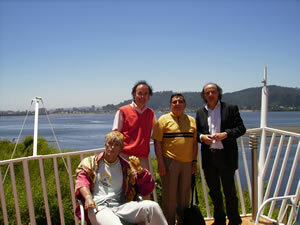 Carlos Barbosa-Lima (Brazil), Gentil Montana (Colombia), Prof. J R Monroy (LACCS-UK) and Eduardo Fernandez (Uruguay). 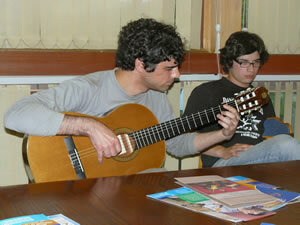 It was an evening of romantic guitar with boleros! A mixture of classical and South American rhythms! Time to depart, but not before an aromatic morning coffee at the Darwin University cafeteria. 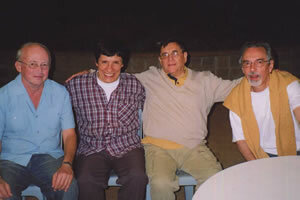 Carlos Barbosa-Lima, Eduardo Fernandez and Juan R Monroy. My camera in action! The Lesser Town Bridge Tower. was built in the second half of the 15th century. Finally to cross the historical site. 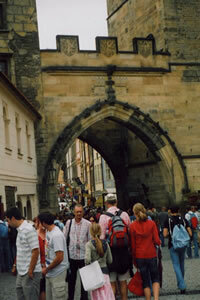 The medieval Charles Bridge to the Old Town, which is a different world with narrow alleys, secluded squares, thin and Gothic towers. 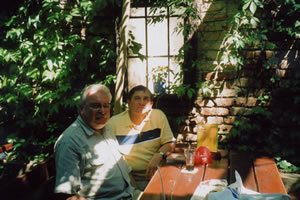 A city who experience the worst time in European history, from Hitler, Stalin and the Cold War. 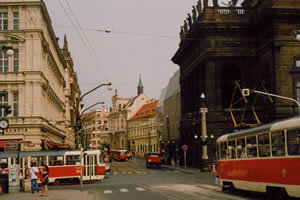 Brno is a medieval city, 800 years old in Central Europe near to Praha, Viena and Bratislava. Today is a cultural centre with universities and judiciary institutions. The legendary Jorge Morel in action! 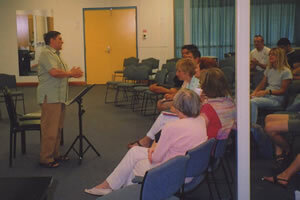 Classes and tutorial session to young guitar students. 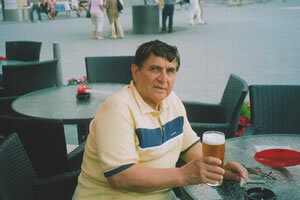 Brno, at the medieval Liberty Square, you can enjoy as I did a nice pint of the famous Czech beer! 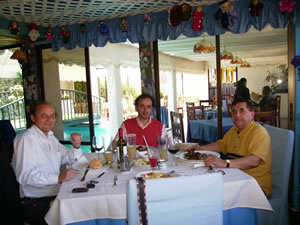 Lunch time: from left to right: Juan R Monroy, Jorge Cardoso, Maria Isabel Siewers and the legendary Jorge Morel. Sociology of the music and the Praxis: An analysis of two decades of experience in the performing arts by LACCS-UK in London. 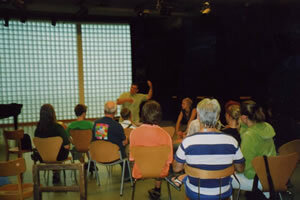 Ideas were discussed with the students related to the origins and form of styles and practical step to be a performer. 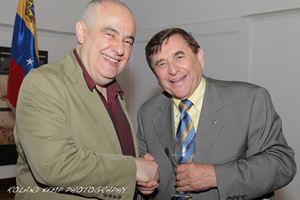 Juan R Monroy, Chairman of LACCS-UK, with Milan Tesar, one of the most important composer for the Czech classical and popular guitar music. 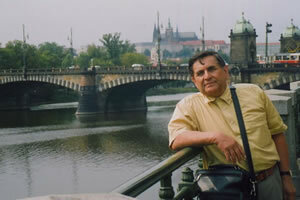 His works are published in various international publishing houses. (Germany, France and Japan amongst others). 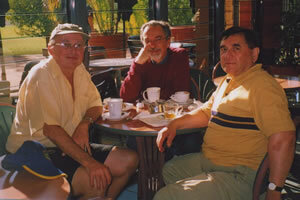 During a break: Prof. J R Monroy with the famous Slovak guitarist Josef Zsapka. Dagmar and Josef Zsapka also constitute an international duo of flute and guitar with a brilliant technique and beautiful sounds with different styles.